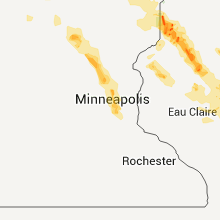 The Mahnomen, MN area has had 3 reports of on-the-ground hail by trained spotters, and has been under severe weather warnings 50 times during the past 12 months. 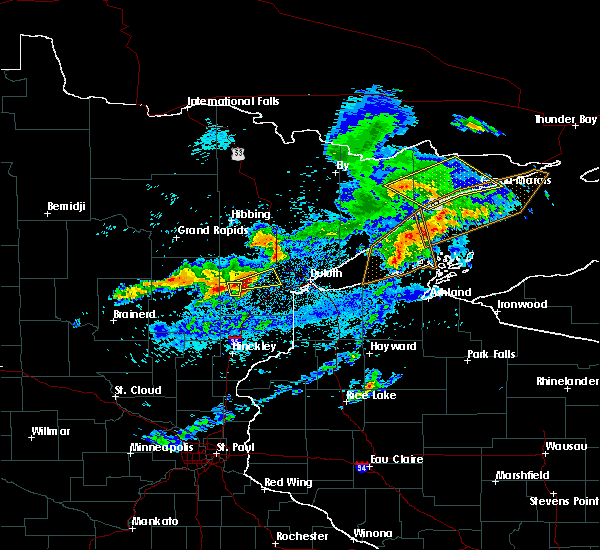 Doppler radar has detected hail at or near Mahnomen, MN on 45 occasions, including 9 occasions during the past year. 9/15/2018 1:44 AM CDT At 144 am cdt, severe thunderstorms were located along a line extending from 7 miles northeast of canyon, to pike lake near duluth, to near fond du lac reservation, moving east at 30 mph (radar indicated). Hazards include 70 mph wind gusts and nickel size hail. Expect considerable tree damage. Damage is likely to mobile homes, roofs, and outbuildings. 9/15/2018 1:31 AM CDT At 131 am cdt, severe thunderstorms were located along a line extending from near cotton, to near canyon, to near brookston, moving east at 40 mph (radar indicated). Hazards include 70 mph wind gusts and quarter size hail. Hail damage to vehicles is expected. expect considerable tree damage. wind damage is also likely to mobile homes, roofs, and outbuildings. Locations impacted include, cloquet, hermantown, scanlon, carlton, cotton, brookston, boulder lake, saginaw, fond du lac reservation, island lake, pike lake near duluth, canyon, city of rice lake, grand lake, fredenberg, mahnomen, alborn, culver, fish lake, and shaw. 9/15/2018 1:18 AM CDT At 118 am cdt, severe thunderstorms were located along a line extending from near cotton, to near canyon, to 8 miles southeast of floodwood, moving east at 40 mph (radar indicated). Hazards include 70 mph wind gusts and quarter size hail. Hail damage to vehicles is expected. expect considerable tree damage. wind damage is also likely to mobile homes, roofs, and outbuildings. Locations impacted include, cloquet, hermantown, scanlon, carlton, cotton, brookston, boulder lake, saginaw, fond du lac reservation, island lake, pike lake near duluth, canyon, city of rice lake, grand lake, fredenberg, mahnomen, alborn, culver, kelsey, and gowan. 9/15/2018 1:01 AM CDT At 101 am cdt, severe thunderstorms were located along a line extending from near toivola, to near meadowlands, to 6 miles south of floodwood, moving east at 40 mph (radar indicated). Hazards include 70 mph wind gusts and quarter size hail. Hail damage to vehicles is expected. expect considerable tree damage. Wind damage is also likely to mobile homes, roofs, and outbuildings. 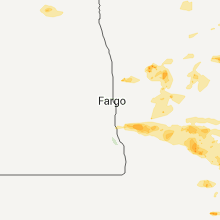 9/14/2018 9:28 PM CDT At 928 pm cdt, a severe thunderstorm was located over twin valley, or 36 miles northeast of fargo, moving east at 30 mph (radar indicated). Hazards include quarter size hail. Damage to vehicles is expected. this severe storm will be near, twin valley and syre around 930 pm cdt. gary around 935 pm cdt. faith and waukon around 950 pm cdt. 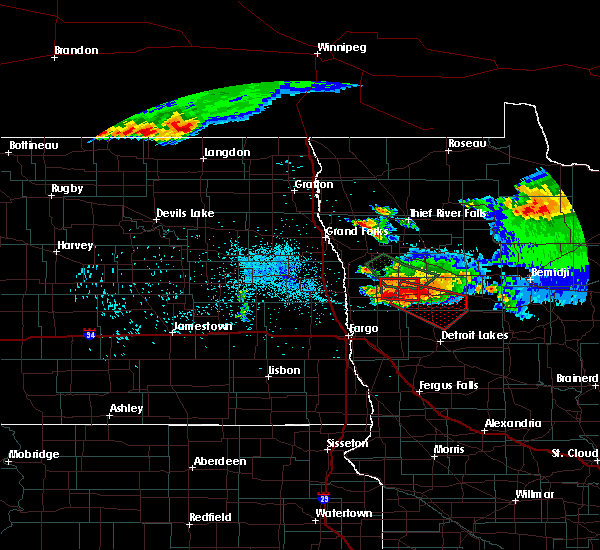 Mahnomen and bejou around 1000 pm cdt. 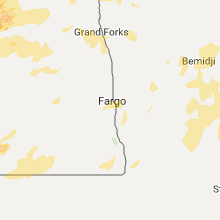 9/14/2018 9:11 PM CDT The national weather service in grand forks has issued a * severe thunderstorm warning for. southeastern norman county in northwestern minnesota. western mahnomen county in northwestern minnesota. until 1000 pm cdt. At 910 pm cdt, a severe thunderstorm was located near ada, or 30. 9/14/2018 8:43 PM CDT At 842 pm cdt, a severe thunderstorm was located near waubun, or 28 miles north of detroit lakes, moving east at 40 mph (radar indicated). Hazards include quarter size hail. Damage to vehicles is expected. this severe thunderstorm will be near, beaulieu around 855 pm cdt. naytahwaush, mahkonce and tulaby lake around 905 pm cdt. roy lake around 910 pm cdt. rice lake around 915 pm cdt. Lower rice lake and long lost lake around 920 pm cdt. 9/12/2018 1:05 PM CDT At 105 pm cdt, a severe thunderstorm was located near bejou, or 41 miles north of detroit lakes, moving northeast at 55 mph (radar indicated). Hazards include quarter size hail. Damage to vehicles is expected. 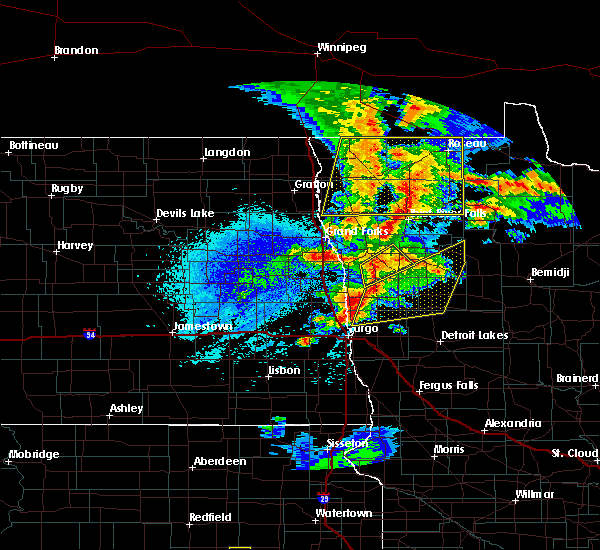 this severe storm will be near, winger around 115 pm cdt. lengby, fosston and island lake in mahnomen county around 125 pm cdt. Ebro around 130 pm cdt. 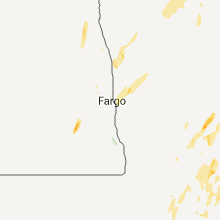 9/12/2018 12:45 PM CDT At 1245 pm cdt, a severe thunderstorm was located near twin valley, or 33 miles northeast of fargo, moving northeast at 55 mph (radar indicated). Hazards include half dollar size hail. Damage to vehicles is expected. this severe thunderstorm will be near, twin valley around 1250 pm cdt. gary around 1255 pm cdt. 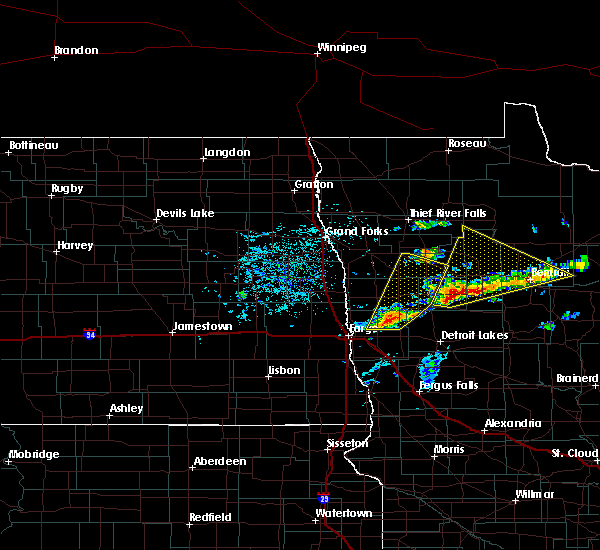 waukon and faith around 100 pm cdt. ranum and mahnomen around 105 pm cdt. Bejou around 110 pm cdt. 8/31/2018 10:07 PM CDT The severe thunderstorm warning for southern st. louis and north central carlton counties will expire at 1015 pm cdt, the storm which prompted the warning has moved out of the area. therefore, the warning will be allowed to expire. however some hail is still possible with this thunderstorm. a severe thunderstorm watch remains in effect until midnight cdt for northeastern minnesota. remember, a severe thunderstorm warning still remains in effect for northeast carlton and southeast st. louis counties. 8/31/2018 9:57 PM CDT At 957 pm cdt, a severe thunderstorm was located near saginaw, or 7 miles north of cloquet, moving east at 50 mph (radar indicated). Hazards include 70 mph wind gusts and quarter size hail. Hail damage to vehicles is expected. expect considerable tree damage. wind damage is also likely to mobile homes, roofs, and outbuildings. Locations impacted include, cloquet, brookston, fond du lac reservation, and mahnomen. 8/31/2018 9:51 PM CDT At 951 pm cdt, a severe thunderstorm was located over fond du lac reservation, or 7 miles northwest of cloquet, moving east at 50 mph (radar indicated). Hazards include 70 mph wind gusts and quarter size hail. Hail damage to vehicles is expected. expect considerable tree damage. wind damage is also likely to mobile homes, roofs, and outbuildings. Locations impacted include, cloquet, brookston, fond du lac reservation, and mahnomen. 8/31/2018 9:41 PM CDT The national weather service in duluth mn has issued a * severe thunderstorm warning for. south central st. louis county in northeastern minnesota. north central carlton county in northeastern minnesota. 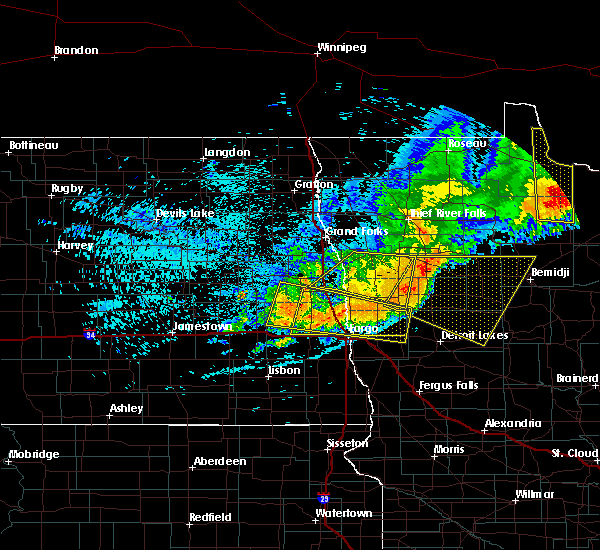 Until 1015 pm cdt * at 940 pm cdt, a severe thunderstorm was located 7 miles northeast. 8/31/2018 8:13 PM CDT At 812 pm cdt, severe thunderstorms were located along a line extending from 6 miles north of cotton, to near canyon, to near scanlon, moving east at 55 mph. these storms have weakened in the past 15 minutes, but still remain capable of producing widespread damaging winds (radar indicated). Hazards include 70 mph wind gusts and penny size hail. Expect considerable tree damage. damage is likely to mobile homes, roofs, and outbuildings. 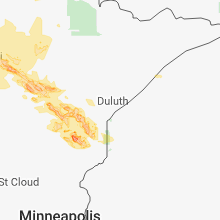 Locations impacted include, duluth, superior, cloquet, hermantown, two harbors, proctor, scanlon, carlton, cotton, thomson, brookston, fairbanks, wolf lake, boulder lake, brimson, pike lake near duluth, city of rice lake, thomas lake near brimson, whiteface reservoir, and canyon. 8/31/2018 8:02 PM CDT At 802 pm cdt, dangerous severe thunderstorms were located along a line extending from near toivola, to near brookston, to 7 miles southwest of cloquet, moving east-northeast at 60 mph. these are very dangerous storms with a history of producing widespread wind damage across aitkin county between 7 and 8 pm (radar indicated). Hazards include 90 mph wind gusts and penny size hail. You are in a life-threatening situation. flying debris may be deadly to those caught without shelter. mobile homes will be heavily damaged or destroyed. homes and businesses will have substantial roof and window damage. Expect extensive tree damage and power outages. 8/31/2018 7:52 PM CDT At 752 pm cdt, dangerous severe thunderstorms were located along a line extending from near floodwood, to near cromwell, moving east at 55 mph. these are very dangerous storms (radar indicated. widespread and severe wind damage reports have been received from aitkin county with these storms within the past 30 minutes). Hazards include 90 mph wind gusts and penny size hail. You are in a life-threatening situation. flying debris may be deadly to those caught without shelter. mobile homes will be heavily damaged or destroyed. homes and businesses will have substantial roof and window damage. expect extensive tree damage and power outages. locations impacted include, cloquet, scanlon, carlton, floodwood, cromwell, thomson, brookston, saginaw, fond du lac reservation, canyon, grand lake, mahnomen, alborn, culver, gowan, sawyer, prosit, esko, twig, and munger. People in brookston, independence, alborn, and along highway 33 between independence and cloquet should seek shelter immediately!!. 8/31/2018 7:39 PM CDT At 739 pm cdt, dangerous severe thunderstorms were located along a line extending from 7 miles east of jacobson, to near tamarack, moving east at 65 mph. these are very dangerous storms (radar indicated). Hazards include 90 mph wind gusts and penny size hail. You are in a life-threatening situation. flying debris may be deadly to those caught without shelter. mobile homes will be heavily damaged or destroyed. homes and businesses will have substantial roof and window damage. expect extensive tree damage and power outages. locations impacted include, cloquet, big sandy lake, scanlon, carlton, mahtowa, floodwood, wrenshall, cromwell, thomson, brookston, tamarack, saginaw, fond du lac reservation, canyon, grand lake, mahnomen, alborn, culver, ball bluff, and wright. people in the savanna portage state park, floodwood, and gowan areas will be impacted by the strongest winds. Seek shelter now!. 8/31/2018 7:28 PM CDT The national weather service in duluth mn has issued a * severe thunderstorm warning for. northeastern aitkin county in east central minnesota. southwestern st. louis county in northeastern minnesota. northern carlton county in northeastern minnesota. Until 815 pm cdt. 8/26/2018 11:45 PM CDT At 1145 pm cdt, severe thunderstorms were located along a line extending from near oklee to near faith, moving northeast at 65 mph (radar indicated). Hazards include 70 mph wind gusts and quarter size hail. Hail damage to vehicles is expected. expect considerable tree damage. wind damage is also likely to mobile homes, roofs, and outbuildings. these severe storms will be near, trail and gully around 1150 pm cdt. beaulieu around 1155 pm cdt. 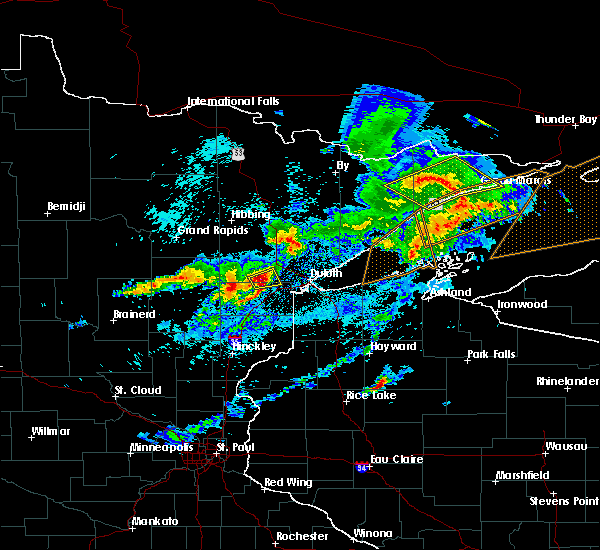 A tornado watch remains in effect until 200 am cdt for northwestern minnesota. 8/26/2018 11:30 PM CDT At 1129 pm cdt, severe thunderstorms were located along a line extending from near mentor to near syre, moving northeast at 65 mph (radar indicated). Hazards include 70 mph wind gusts and quarter size hail. Hail damage to vehicles is expected. expect considerable tree damage. wind damage is also likely to mobile homes, roofs, and outbuildings. these severe storms will be near, erskine and mcintosh around 1135 pm cdt. gary around 1140 pm cdt. 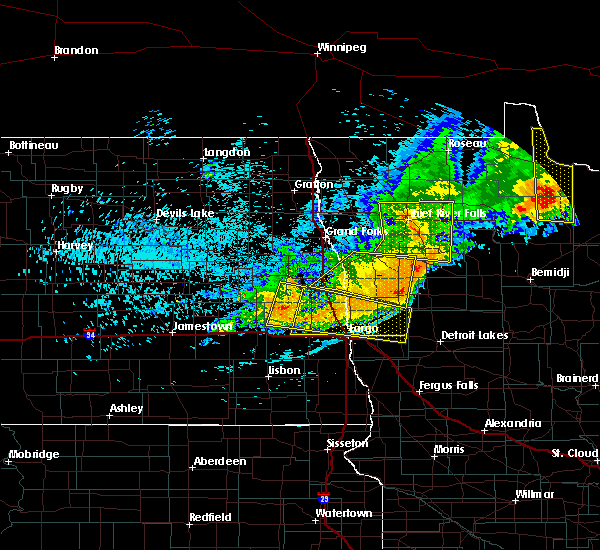 faith and waukon around 1145 pm cdt. 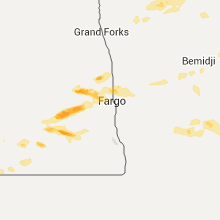 mahnomen, trail and gully around 1150 pm cdt. bejou and beaulieu around 1155 pm cdt. 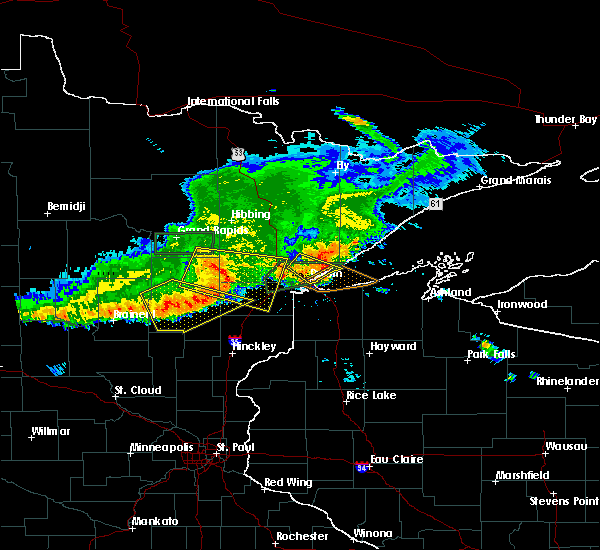 A tornado watch remains in effect until 200 am cdt for northwestern minnesota. 8/26/2018 11:12 PM CDT At 1112 pm cdt, severe thunderstorms were located along a line extending from near fertile to near kragnes, moving northeast at 65 mph (radar indicated). Hazards include 60 mph wind gusts and quarter size hail. Hail damage to vehicles is expected. expect wind damage to roofs, siding, and trees. severe thunderstorms will be near, flaming around 1115 pm cdt. 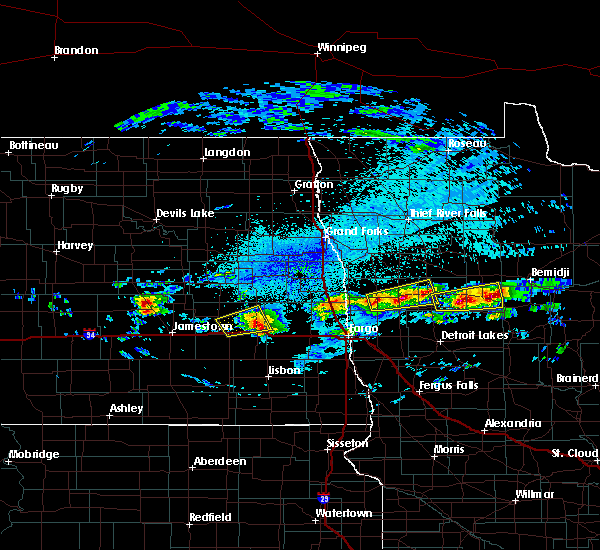 fertile around 1120 pm cdt. 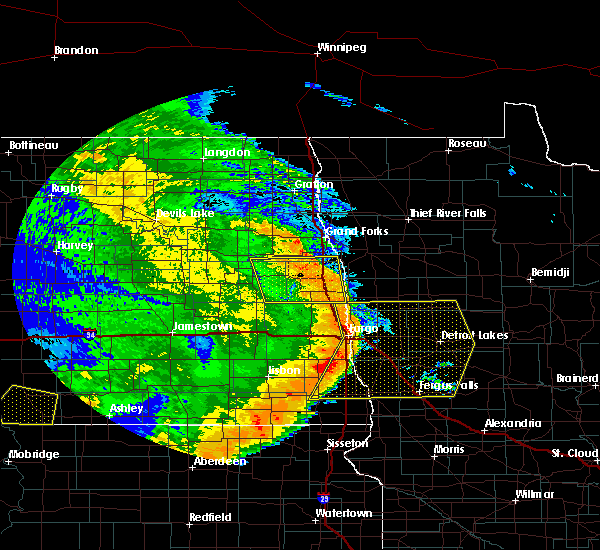 borup around 1125 pm cdt. erskine around 1130 pm cdt. twin valley, syre and mcintosh around 1135 pm cdt. 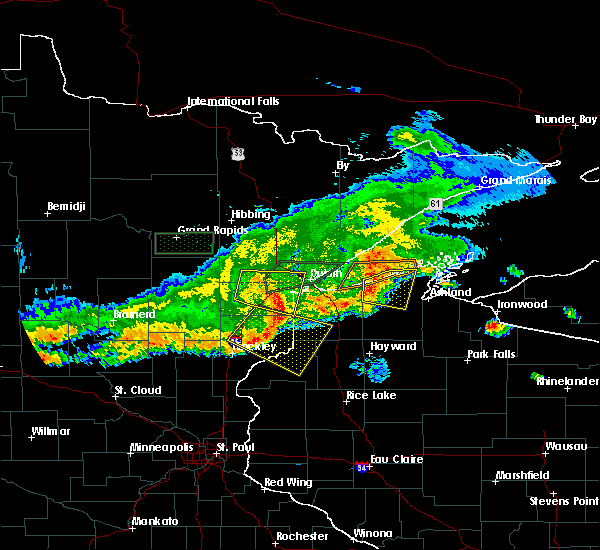 A tornado watch remains in effect until 200 am cdt for northwestern minnesota. 8/26/2018 4:36 PM CDT At 436 pm cdt, a severe thunderstorm was located near fond du lac reservation, or 8 miles west of cloquet, moving northeast at 35 mph (radar indicated). Hazards include 60 mph wind gusts and penny size hail. Expect damage to roofs, siding, and trees. Locations impacted include, cloquet, scanlon, mahtowa, fond du lac reservation, mahnomen, and sawyer. 6/30/2018 3:28 AM CDT At 327 am cdt, severe thunderstorms were located along a line extending from 7 miles west of boulder lake, to near proctor, to 6 miles north of duxbury, moving east at 45 mph (radar indicated). Hazards include 60 mph wind gusts and quarter size hail. Hail damage to vehicles is expected. expect wind damage to roofs, siding, and trees. these severe storms will be near, hermantown, proctor and oliver around 335 am cdt. duluth, boulder lake and island lake around 340 am cdt. 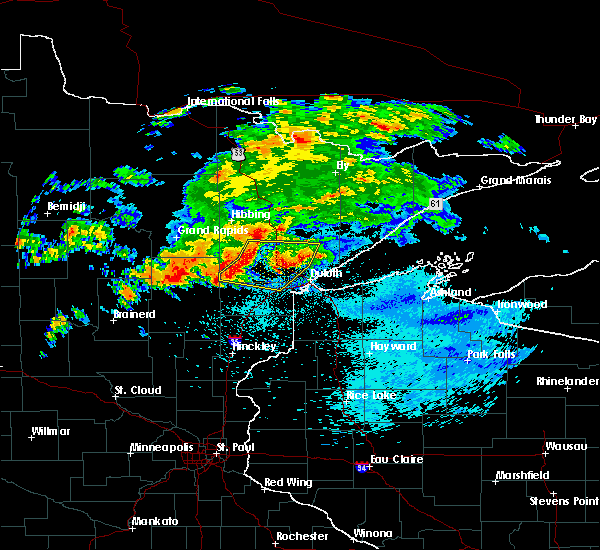 superior, dairyland, wisconsin point and south range around 345 am cdt. Other locations impacted by these severe thunderstorms include cody, billings park, gary new duluth, duquette, fish lake, moose junction, amnicon lake, banning state park, spirit valley, and jay cooke state park. 6/30/2018 3:16 AM CDT At 315 am cdt, severe thunderstorms were located along a line extending from near canyon, to scanlon, to near bruno, moving east at 45 mph (radar indicated). Hazards include 60 mph wind gusts and quarter size hail. Hail damage to vehicles is expected. expect wind damage to roofs, siding, and trees. these severe storms will be near, carlton, wrenshall and thomson around 320 am cdt. 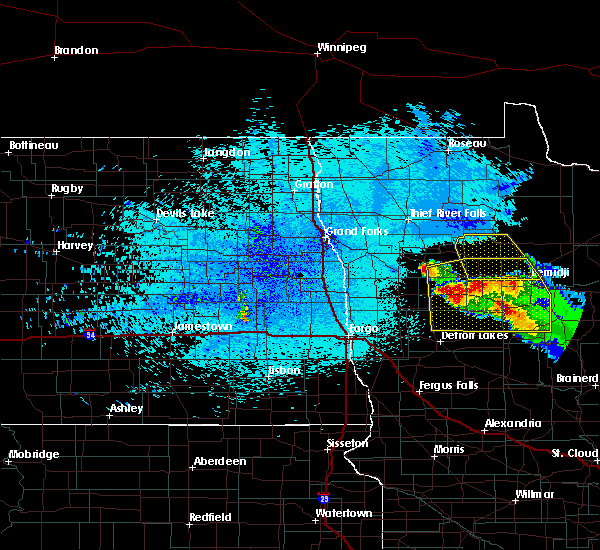 hermantown and proctor around 330 am cdt. oliver, boulder lake and cloverton around 335 am cdt. superior and island lake around 340 am cdt. 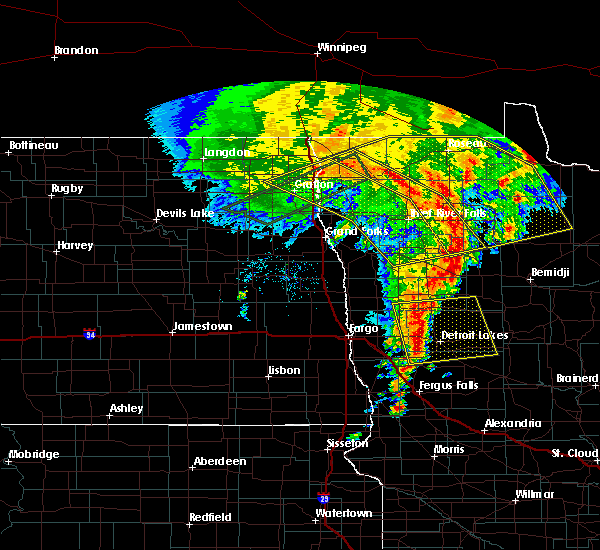 dairyland, wisconsin point and south range around 345 am cdt. Other locations impacted by these severe thunderstorms include cody, billings park, gary new duluth, duquette, fish lake, moose junction, amnicon lake, banning state park, spirit valley, and jay cooke state park. 6/30/2018 3:00 AM CDT At 259 am cdt, severe thunderstorms were located along a line extending from near meadowlands, to 6 miles southwest of fond du lac reservation, to near askov, moving east at 45 mph (radar indicated). Hazards include 60 mph wind gusts and quarter size hail. Hail damage to vehicles is expected. expect wind damage to roofs, siding, and trees. 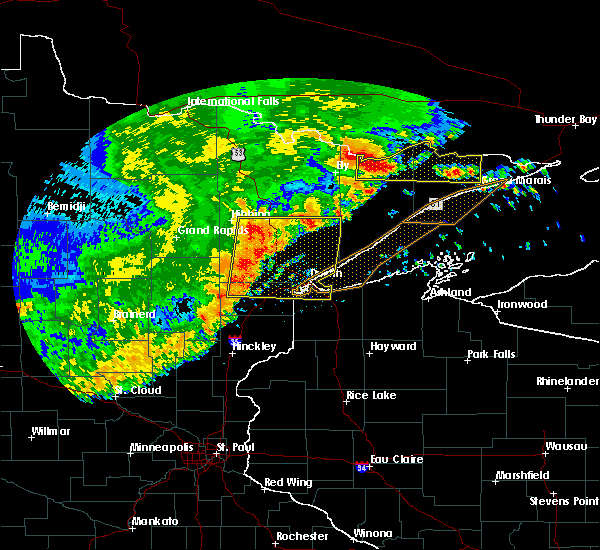 severe thunderstorms will be near, cloquet around 310 am cdt. 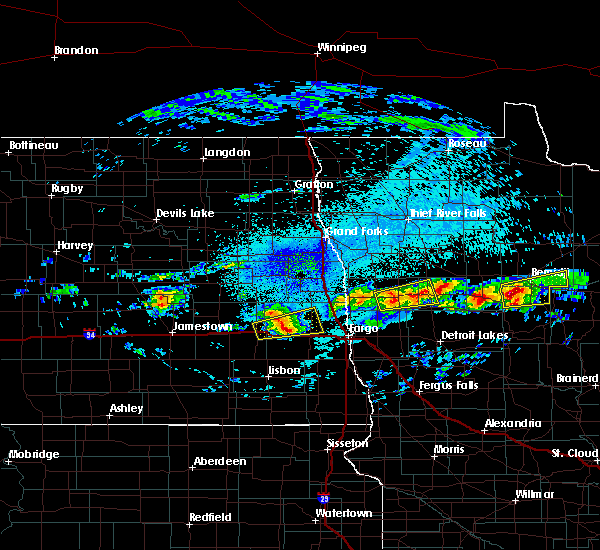 scanlon, fond du lac reservation and canyon around 315 am cdt. carlton, wrenshall and thomson around 320 am cdt. 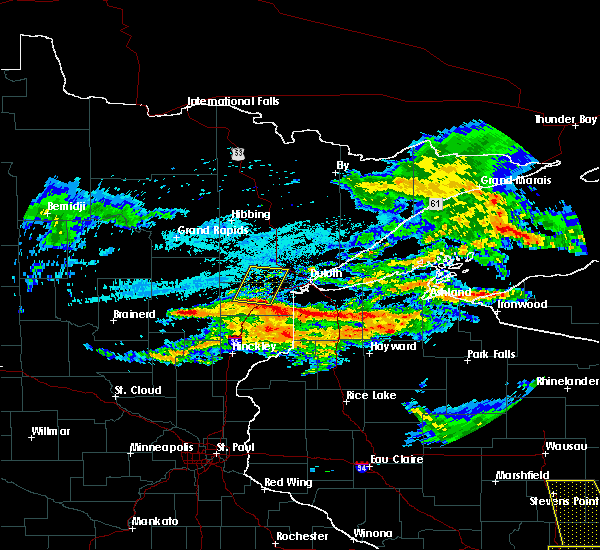 hermantown, proctor and oliver around 330 am cdt. boulder lake, cloverton and island lake around 335 am cdt. 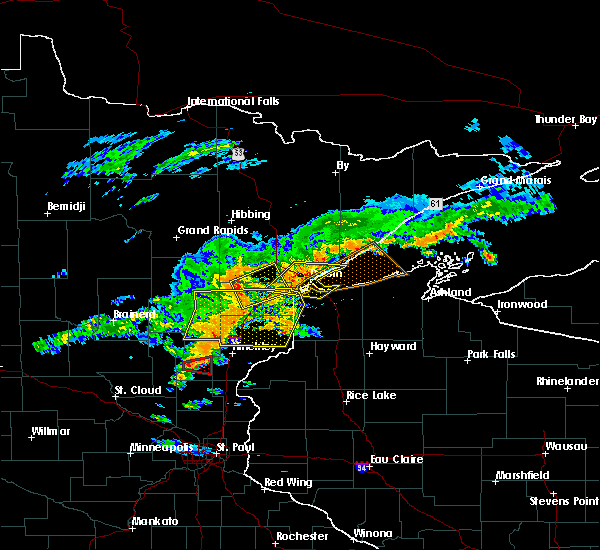 duluth and superior around 340 am cdt. 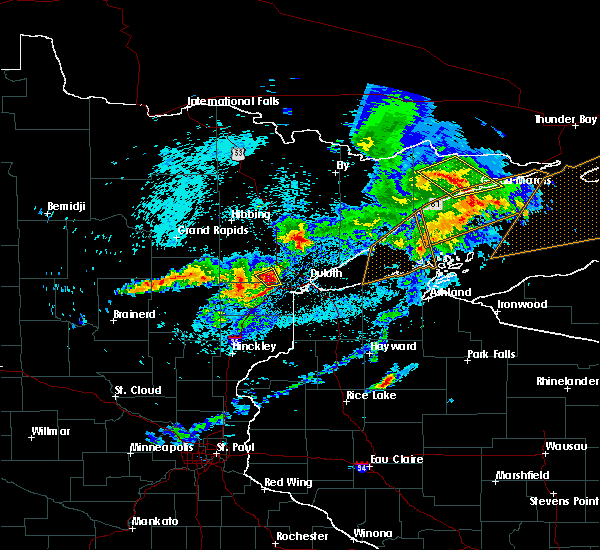 dairyland, wisconsin point and south range around 345 am cdt. Other locations impacted by these severe thunderstorms include cody, billings park, gary new duluth, duquette, fish lake, moose junction, amnicon lake, banning state park, spirit valley, and jay cooke state park. 6/29/2018 5:19 AM CDT At 441 am cdt, severe thunderstorms were located along a line extending from near fertile to near borup to near averill, moving east at 55 mph. these are very dangerous storms (public). Hazards include 80 mph wind gusts and penny size hail. Flying debris will be dangerous to those caught without shelter. mobile homes will be heavily damaged. expect considerable damage to roofs, windows, and vehicles. extensive tree damage and power outages are likely. 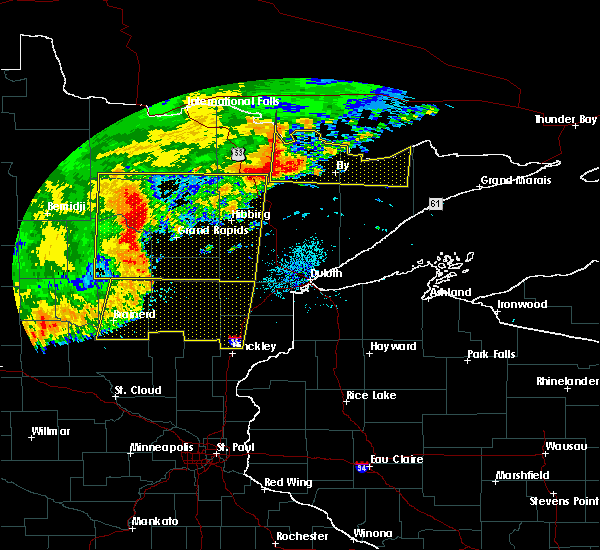 severe thunderstorms will be near, flaming and twin valley around 445 am cdt. 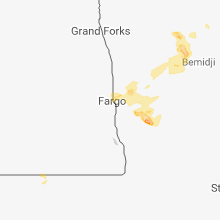 rindal, ranum and syre around 450 am cdt. flom and faith around 455 am cdt. hitterdal, bejou and mahnomen around 500 am cdt. 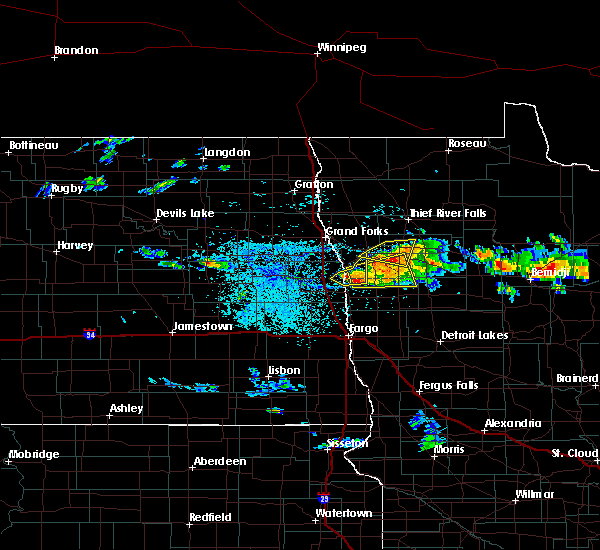 waubun and ogema around 505 am cdt. other locations impacted by these severe thunderstorms include many point scout camp. This storm has a history of producing wind speeds in excess of 80 mph. 6/29/2018 4:42 AM CDT At 441 am cdt, severe thunderstorms were located along a line extending from near fertile to near borup to near averill, moving east at 55 mph. these are very dangerous storms (public). Hazards include 80 mph wind gusts and penny size hail. Flying debris will be dangerous to those caught without shelter. mobile homes will be heavily damaged. expect considerable damage to roofs, windows, and vehicles. extensive tree damage and power outages are likely. 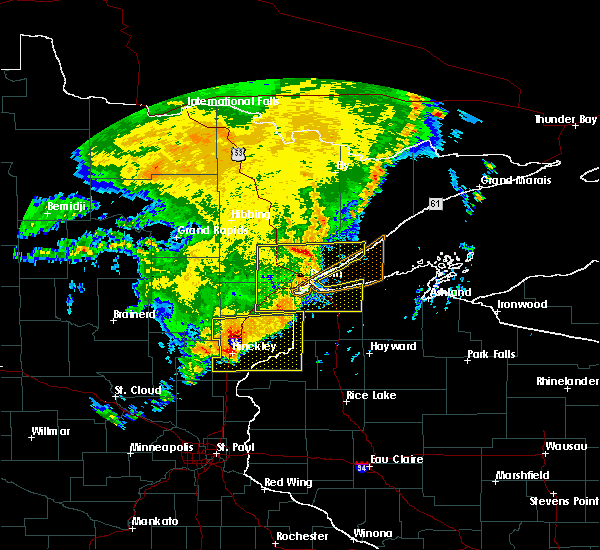 severe thunderstorms will be near, flaming and twin valley around 445 am cdt. rindal, ranum and syre around 450 am cdt. flom and faith around 455 am cdt. 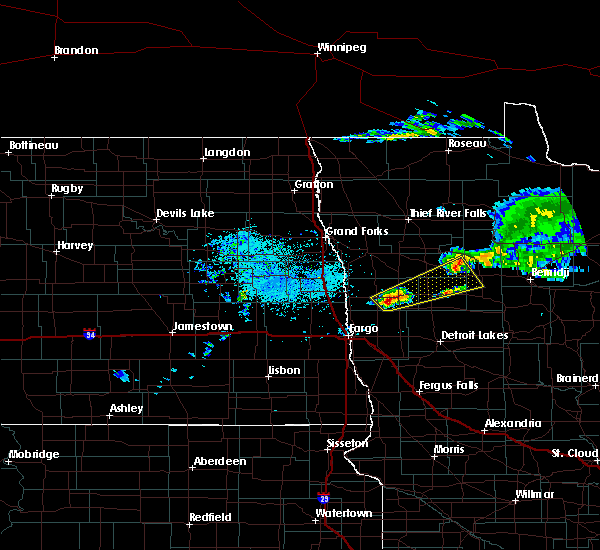 hitterdal, bejou and mahnomen around 500 am cdt. 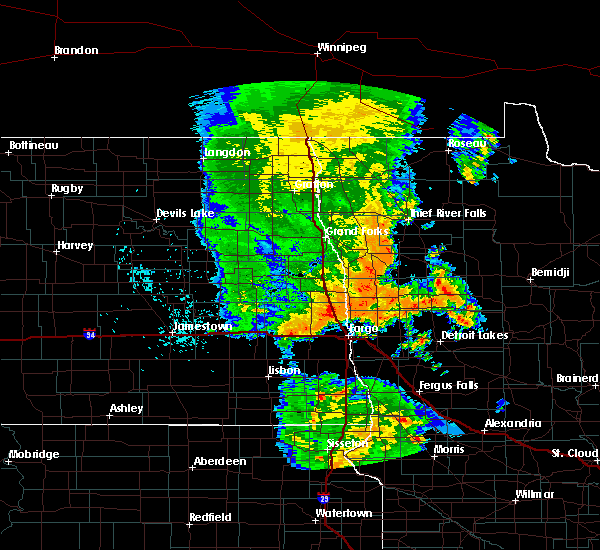 waubun and ogema around 505 am cdt. other locations impacted by these severe thunderstorms include many point scout camp. This storm has a history of producing wind speeds in excess of 80 mph. 6/28/2018 3:10 PM CDT The tornado warning for northeastern norman, southeastern polk and western mahnomen counties will expire at 315 pm cdt, the storm which prompted the warning has weakened below severe limits, and no longer appears capable of producing a tornado. therefore, the warning will be allowed to expire. however small hail, gusty winds and heavy rain are still possible with this thunderstorm. 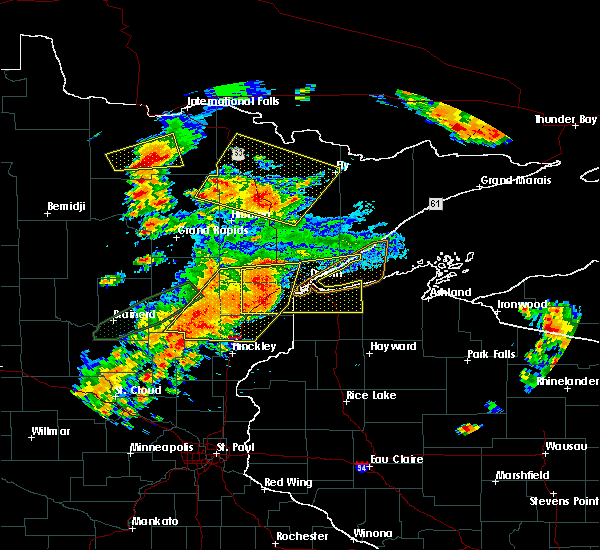 a severe thunderstorm watch remains in effect until 900 pm cdt for northwestern minnesota. 6/28/2018 2:48 PM CDT At 247 pm cdt, a severe thunderstorm capable of producing a tornado was located over rindal, or 43 miles south of thief river falls, moving southeast at 25 mph (radar indicated rotation). Hazards include tornado and quarter size hail. Expect damage to mobile homes, roofs, and vehicles. this dangerous storm will be near, ranum around 250 pm cdt. winger around 300 pm cdt. bejou around 310 pm cdt. 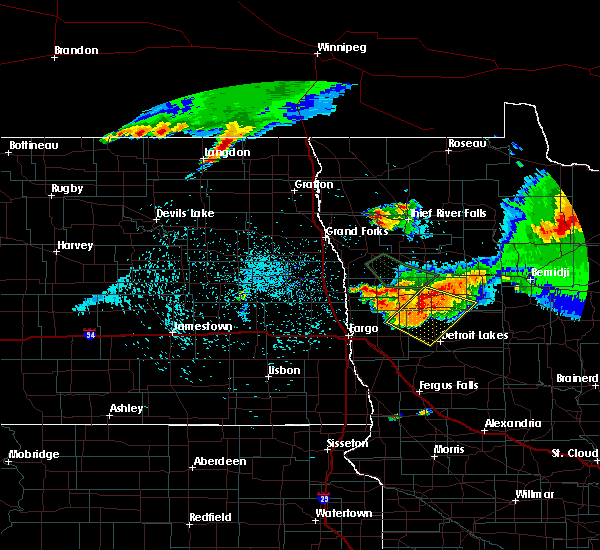 Mahnomen around 315 pm cdt. 6/28/2018 2:42 PM CDT At 242 pm cdt, severe thunderstorms were located along a line extending from 6 miles north of mcintosh to near winger to flaming to lockhart, moving east at 10 mph (radar indicated). Hazards include 60 mph wind gusts and quarter size hail. Hail damage to vehicles is expected. expect wind damage to roofs, siding, and trees. Locations impacted include, fosston, mahnomen, fertile, mcintosh, erskine, island lake in mahnomen county and winger. 6/28/2018 2:25 PM CDT At 225 pm cdt, severe thunderstorms were located along a line extending from near brooks to near winger to near flaming to near shelly, moving southeast at 25 mph (radar indicated). Hazards include 60 mph wind gusts and quarter size hail. Hail damage to vehicles is expected. expect wind damage to roofs, siding, and trees. Locations impacted include, ada, fosston, mahnomen, fertile, mcintosh, erskine and oklee. 6/28/2018 2:13 PM CDT At 213 pm cdt, severe thunderstorms were located along a line extending from near brooks to near rindal to 6 miles east of lockhart to caledonia, moving southeast at 25 mph (radar indicated). Hazards include 60 mph wind gusts and quarter size hail. Hail damage to vehicles is expected. Expect wind damage to roofs, siding, and trees. 6/17/2018 2:53 PM CDT The severe thunderstorm warning for south central st. louis and northeastern carlton counties will expire at 300 pm cdt, the storm which prompted the warning has weakened below severe limits, and no longer poses an immediate threat to life or property. therefore, the warning will be allowed to expire. however gusty winds are still possible with this thunderstorm. a tornado watch remains in effect until 900 pm cdt for northeastern minnesota. 6/17/2018 2:49 PM CDT At 248 pm cdt, a severe thunderstorm was located near hermantown, or 7 miles northeast of cloquet, moving northeast at 45 mph (radar indicated). Hazards include 70 mph wind gusts and quarter size hail. Hail damage to vehicles is expected. expect considerable tree damage. wind damage is also likely to mobile homes, roofs, and outbuildings. locations impacted include, cloquet, scanlon, carlton, wrenshall, thomson, brookston, saginaw, fond du lac reservation, mahnomen, culver, burnett, jay cooke state park, and esko. A tornado watch remains in effect until 900 pm cdt for northeastern minnesota. 6/17/2018 2:34 PM CDT At 234 pm cdt, a severe thunderstorm was located near cloquet, moving east at 45 mph (radar indicated). Hazards include 70 mph wind gusts and quarter size hail. Hail damage to vehicles is expected. expect considerable tree damage. wind damage is also likely to mobile homes, roofs, and outbuildings. locations impacted include, cloquet, scanlon, carlton, mahtowa, wrenshall, thomson, brookston, saginaw, fond du lac reservation, mahnomen, culver, burnett, sawyer, jay cooke state park, and esko. A tornado watch remains in effect until 900 pm cdt for northeastern minnesota. 6/17/2018 2:25 PM CDT At 225 pm cdt, a severe thunderstorm was located near cromwell, or 13 miles west of cloquet, moving northeast at 50 mph (radar indicated). Hazards include 70 mph wind gusts and quarter size hail. Hail damage to vehicles is expected. expect considerable tree damage. Wind damage is also likely to mobile homes, roofs, and outbuildings. 6/17/2018 2:01 PM CDT At 200 pm cdt, a severe thunderstorm was located over cloquet, moving east at 30 mph (radar indicated). Hazards include 70 mph wind gusts and half dollar size hail. Hail damage to vehicles is expected. expect considerable tree damage. wind damage is also likely to mobile homes, roofs, and outbuildings. locations impacted include, cloquet, scanlon, carlton, wrenshall, thomson, saginaw, fond du lac reservation, mahnomen, esko, sawyer, and jay cooke state park. A tornado watch remains in effect until 900 pm cdt for northeastern minnesota. 6/17/2018 1:50 PM CDT At 149 pm cdt, a severe thunderstorm was located near fond du lac reservation, just west of cloquet, moving east at 30 mph (radar indicated). Hazards include 70 mph wind gusts and half dollar size hail. Hail damage to vehicles is expected. expect considerable tree damage. wind damage is also likely to mobile homes, roofs, and outbuildings. locations impacted include, cloquet, scanlon, carlton, wrenshall, cromwell, thomson, saginaw, fond du lac reservation, mahnomen, sawyer, esko, kettle lake, and jay cooke state park. 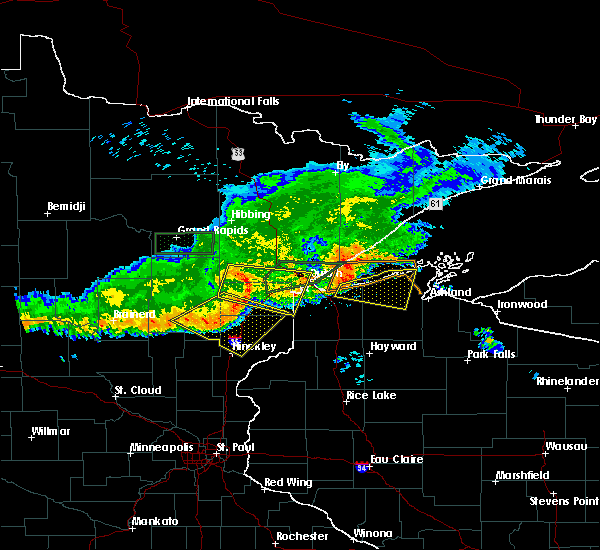 A tornado watch remains in effect until 900 pm cdt for northeastern minnesota. 6/17/2018 1:32 PM CDT At 132 pm cdt, a severe thunderstorm was located near cromwell, or 16 miles west of cloquet, moving east at 30 mph (radar indicated). Hazards include 70 mph wind gusts and half dollar size hail. Hail damage to vehicles is expected. expect considerable tree damage. Wind damage is also likely to mobile homes, roofs, and outbuildings. 6/8/2018 7:29 PM CDT The national weather service in grand forks has issued a * severe thunderstorm warning for. northeastern norman county in northwestern minnesota. western mahnomen county in northwestern minnesota. until 815 pm cdt. 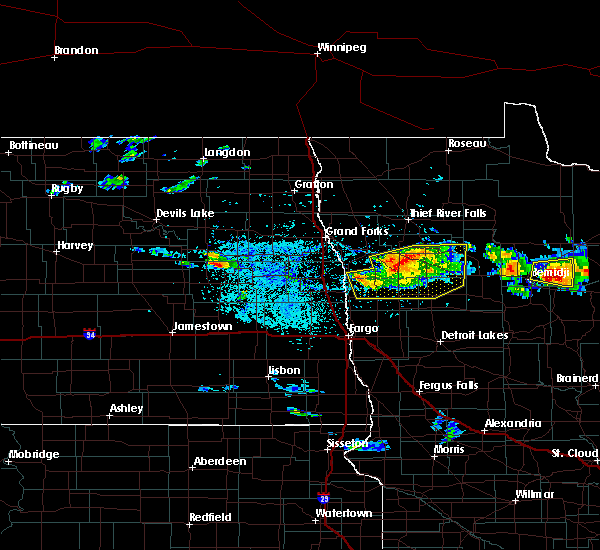 At 729 pm cdt, a severe thunderstorm was located over waukon, or 41. 9/22/2017 6:49 AM CDT At 649 am cdt, a severe thunderstorm was located near hermantown, or 8 miles northeast of cloquet, moving northeast at 50 mph (radar indicated). Hazards include 60 mph wind gusts and quarter size hail. Hail damage to vehicles is expected. expect wind damage to roofs, siding, and trees. Locations impacted include, duluth, superior, cloquet, hermantown, proctor, scanlon, carlton, mahtowa, wrenshall, oliver, thomson, pike lake near duluth, saginaw, island lake, boulder lake, grand lake, fredenberg, mahnomen, irving, and cody. 9/22/2017 6:41 AM CDT At 641 am cdt, a severe thunderstorm was located over cloquet, moving northeast at 45 mph (radar indicated). Hazards include 60 mph wind gusts and quarter size hail. Hail damage to vehicles is expected. Expect wind damage to roofs, siding, and trees. 7/21/2017 8:32 PM CDT At 832 pm cdt, a severe thunderstorm was located over wrenshall, or 9 miles southeast of cloquet, moving east at 35 mph (radar indicated). Hazards include 60 mph wind gusts and penny size hail. Expect damage to roofs, siding, and trees. this severe storm will be near, foxboro around 845 pm cdt. Other locations impacted by this severe thunderstorm include pleasant valley, gary new duluth, munger, morgan park, sawyer, fond du lac, mahnomen, jay cooke state park, norton park, and esko. 7/21/2017 8:20 PM CDT At 820 pm cdt, a severe thunderstorm was located near carlton, or near cloquet, moving east at 30 mph (radar indicated). Hazards include 60 mph wind gusts and penny size hail. Expect damage to roofs, siding, and trees. this severe storm will be near, scanlon around 825 pm cdt. carlton around 830 pm cdt. wrenshall and thomson around 835 pm cdt. oliver and foxboro around 845 pm cdt. Other locations impacted by this severe thunderstorm include gowan, cody, grand lake, pleasant valley, gary new duluth, munger, morgan park, sawyer, spirit valley, and fond du lac. 7/21/2017 7:59 PM CDT At 757 pm cdt, a severe thunderstorm was located near cromwell, or 12 miles west of cloquet, moving east at 35 mph (radar indicated). Hazards include 60 mph wind gusts and nickel size hail. Expect damage to roofs, siding, and trees. this severe thunderstorm will be near, mahtowa and barnum around 810 pm cdt. scanlon around 820 pm cdt. carlton, wrenshall and thomson around 825 pm cdt. holyoke around 830 pm cdt. oliver and foxboro around 840 pm cdt. Other locations impacted by this severe thunderstorm include gowan, cody, grand lake, gary new duluth, morgan park, wright, sawyer, spirit valley, jay cooke state park, and norton park. 7/21/2017 7:38 PM CDT At 737 pm cdt, a severe thunderstorm was located 7 miles northwest of cromwell, or 16 miles east of big sandy lake, moving east at 40 mph (radar indicated). Hazards include 70 mph wind gusts and quarter size hail. Hail damage to vehicles is expected. expect considerable tree damage. wind damage is also likely to mobile homes, roofs, and outbuildings. 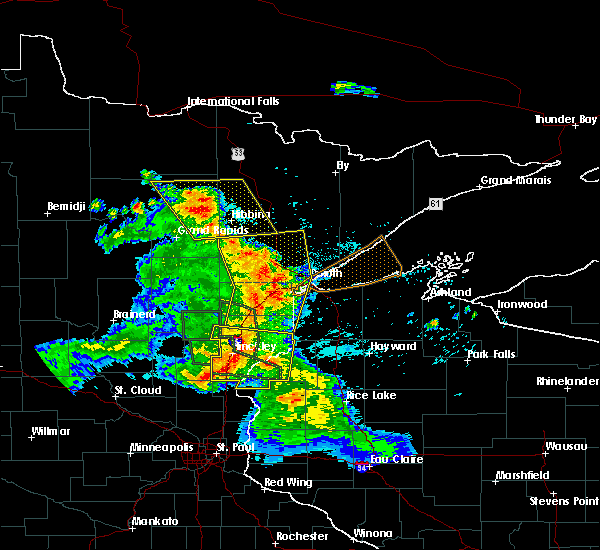 this severe storm will be near, cloquet around 800 pm cdt. Other locations impacted by this severe thunderstorm include gowan, grand lake, ball bluff, sheshebee, wright, savanna portage state park, burnett, wawina, sawyer, and island. 7/21/2017 7:14 PM CDT At 714 pm cdt, a severe thunderstorm was located near libby, or near big sandy lake, moving east at 50 mph (radar indicated). Hazards include 70 mph wind gusts and quarter size hail. Hail damage to vehicles is expected. expect considerable tree damage. wind damage is also likely to mobile homes, roofs, and outbuildings. this severe thunderstorm will be near, tamarack around 725 pm cdt. cromwell around 740 pm cdt. 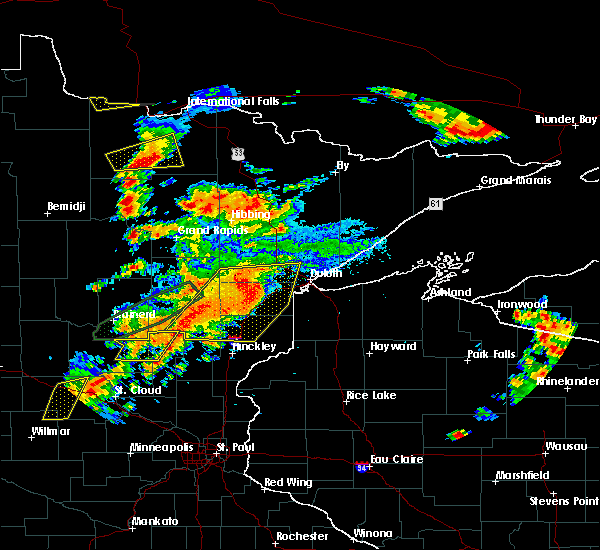 cloquet and mahtowa around 755 pm cdt. Other locations impacted by this severe thunderstorm include gowan, grand lake, ball bluff, sheshebee, wright, savanna portage state park, burnett, wawina, sawyer, and island. 7/17/2017 7:09 PM CDT At 657 pm cdt, severe thunderstorms were located along a line extending from 9 miles southwest of brookston, to 6 miles west of sandstone, moving east at 40 mph (radar indicated). Hazards include 60 mph wind gusts and quarter size hail. Hail damage to vehicles is expected. expect wind damage to roofs, siding, and trees. 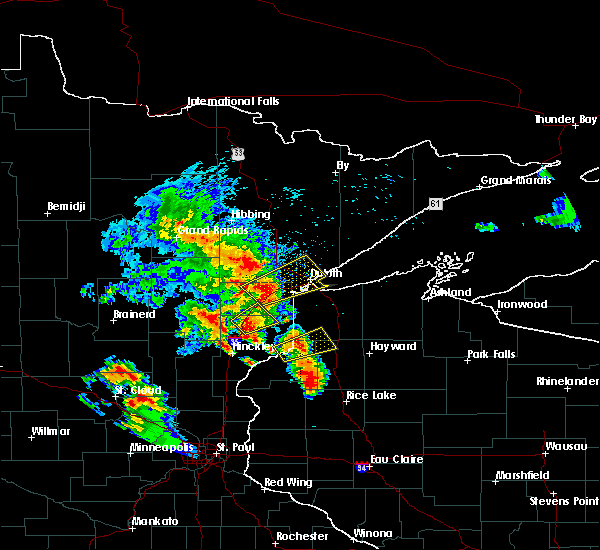 these severe storms will be near, cloquet and askov around 715 pm cdt. bruno around 720 pm cdt. Other locations impacted by these severe thunderstorms include finlayson, arthyde, moose lake state park, wright, dads corner, denham, sawyer, banning state park, automba, and mahnomen. 7/17/2017 6:58 PM CDT At 657 pm cdt, severe thunderstorms were located along a line extending from 9 miles southwest of brookston, to 6 miles west of sandstone, moving east at 40 mph (radar indicated). Hazards include 60 mph wind gusts and quarter size hail. Hail damage to vehicles is expected. expect wind damage to roofs, siding, and trees. 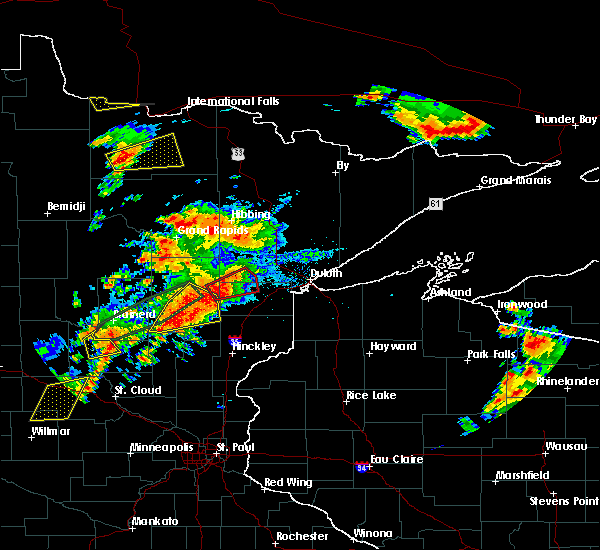 these severe storms will be near, cloquet and askov around 715 pm cdt. bruno around 720 pm cdt. Other locations impacted by these severe thunderstorms include finlayson, arthyde, moose lake state park, wright, dads corner, denham, sawyer, banning state park, automba, and mahnomen. 7/17/2017 6:43 PM CDT At 643 pm cdt, severe thunderstorms were located along a line extending from 10 miles southwest of floodwood, to 6 miles south of mcgrath, moving east at 25 mph (radar indicated). Hazards include 60 mph wind gusts and quarter size hail. Hail damage to vehicles is expected. expect wind damage to roofs, siding, and trees. severe thunderstorms will be near, rutledge around 725 pm cdt. askov around 735 pm cdt. 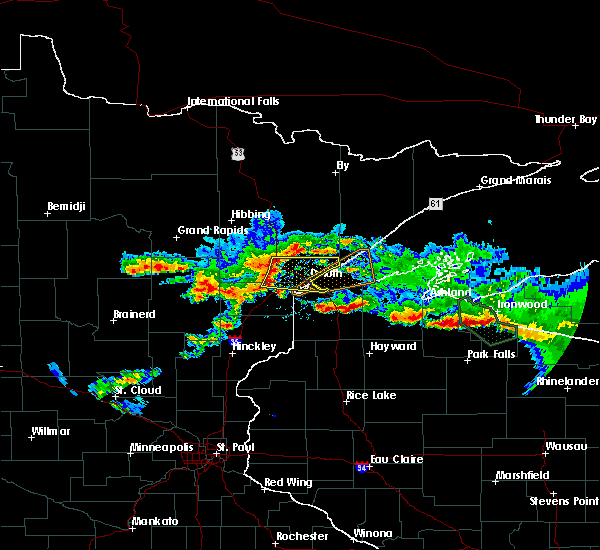 cloquet around 740 pm cdt. bruno around 745 pm cdt. Other locations impacted by these severe thunderstorms include finlayson, arthyde, moose lake state park, sheshebee, wright, lawler, dads corner, denham, sawyer, and banning state park. 7/6/2017 5:17 AM CDT At 515 am cdt, severe thunderstorms were located along a line extending from near toivola, to near cloquet, to near bruno, moving east at 50 mph (radar indicated). Hazards include 70 mph wind gusts and quarter size hail. Hail damage to vehicles is expected. expect considerable tree damage. wind damage is also likely to mobile homes, roofs, and outbuildings. 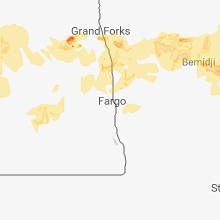 Locations impacted include, duluth, superior, cloquet, hermantown, proctor, scanlon, carlton, mahtowa, barnum, floodwood, cotton, willow river, wrenshall, oliver, cromwell, holyoke, kettle river, toivola, thomson, and brookston. 7/6/2017 5:02 AM CDT At 502 am cdt, severe thunderstorms were located along a line extending from 8 miles west of toivola, to 6 miles north of cromwell, to 6 miles west of willow river, moving east at 50 mph (radar indicated). Hazards include 70 mph wind gusts and quarter size hail. Hail damage to vehicles is expected. expect considerable tree damage. wind damage is also likely to mobile homes, roofs, and outbuildings. locations impacted include, duluth, superior, cloquet, hermantown, proctor, scanlon, carlton, swan river, mahtowa, barnum, floodwood, cotton, willow river, wrenshall, oliver, cromwell, holyoke, warba, kettle river, and toivola. 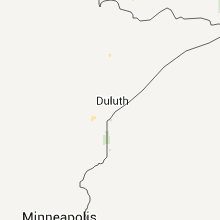 This also includes interstate 35 between barnum and duluth and state highway 61 between duluth and two harbors. 7/6/2017 4:44 AM CDT At 443 am cdt, severe thunderstorms were located along a line extending from near warba, to 6 miles north of tamarack, to 6 miles north of mcgrath, moving east at 50 mph (radar indicated). Hazards include 70 mph wind gusts and quarter size hail. Hail damage to vehicles is expected. expect considerable tree damage. Wind damage is also likely to mobile homes, roofs, and outbuildings. 6/13/2017 10:01 PM CDT A severe thunderstorm warning remains in effect until 1030 pm cdt for eastern norman. southwestern wadena. eastern otter tail. mahnomen. becker and southern clearwater counties. 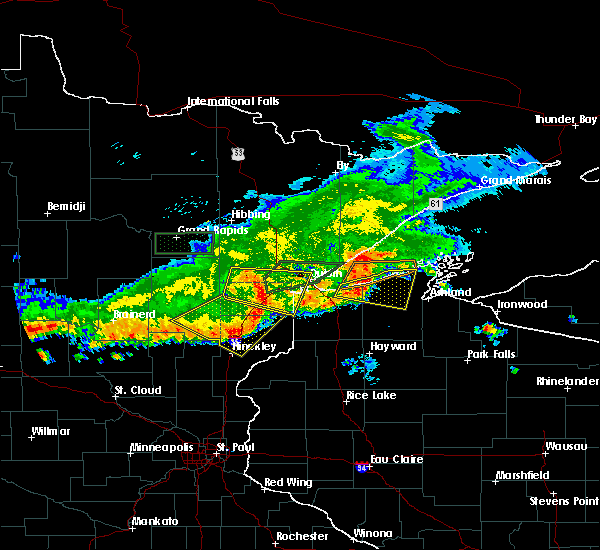 At 1000 pm cdt, severe thunderstorms were located along a line extending from hitterdal to near perham to near urbank, and are nearly stationary. 6/13/2017 9:37 PM CDT At 936 pm cdt, severe thunderstorms were located along a line extending from hitterdal to near perham to near urbank, and are nearly stationary (public. 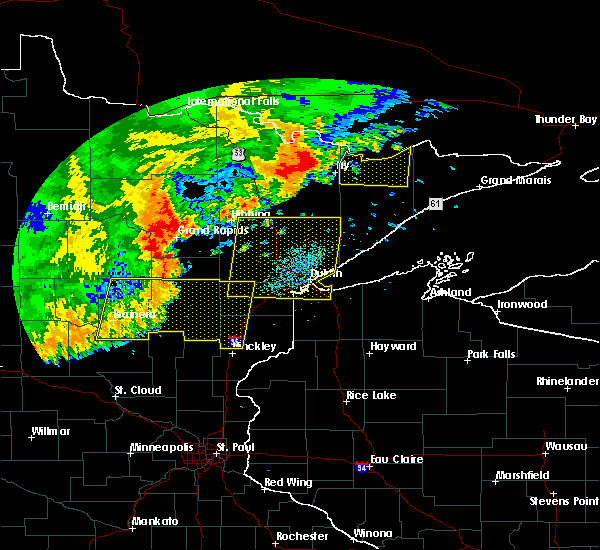 this storm has a history of producing damaging winds). Hazards include 60 mph wind gusts and penny size hail. Expect damage to roofs, siding, and trees. 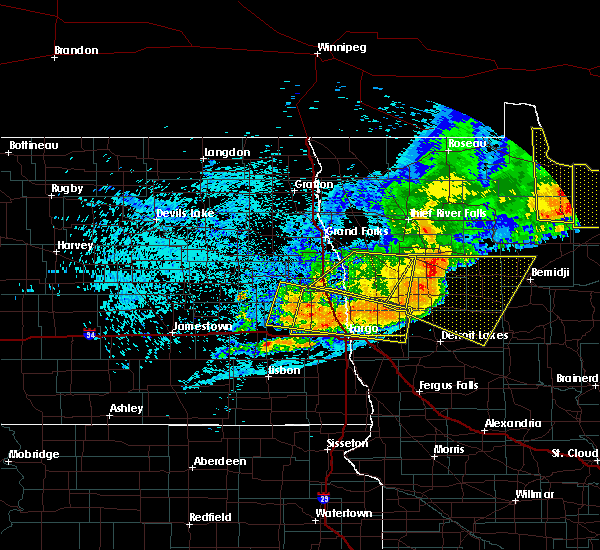 severe thunderstorms will be near, vergas and dale around 940 pm cdt. hitterdal around 955 pm cdt. 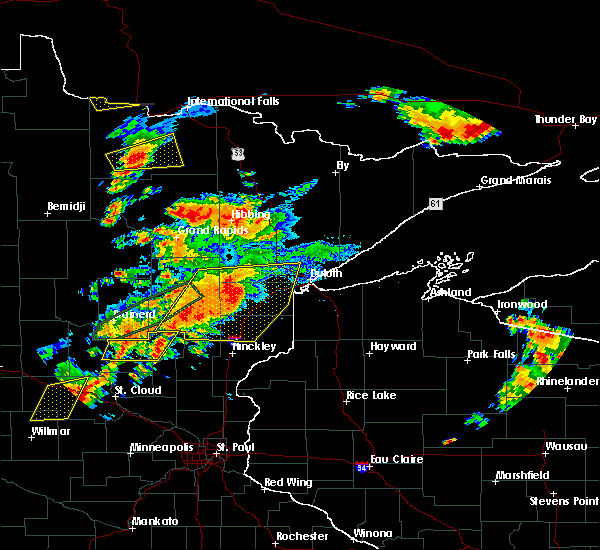 perham around 1000 pm cdt. Frazee, ulen and almora around 1030 pm cdt. 6/13/2017 3:41 PM CDT At 341 pm cdt, a severe thunderstorm was located over waukon, or 41 miles north of detroit lakes, moving northeast at 45 mph (radar indicated). Hazards include 60 mph wind gusts and quarter size hail. Hail damage to vehicles is expected. expect wind damage to roofs, siding, and trees. 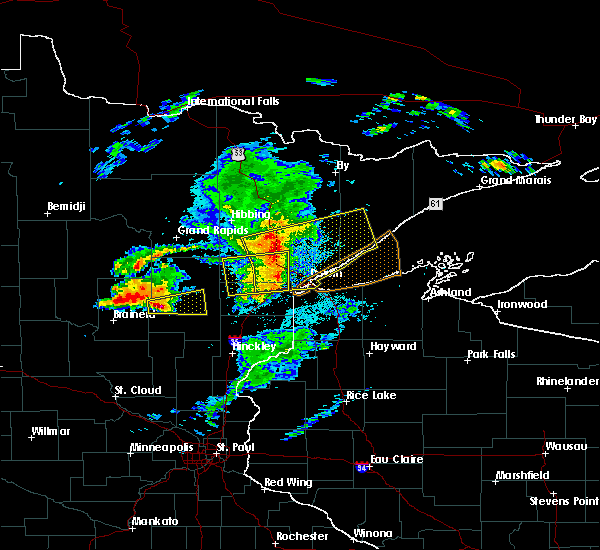 this severe storm will be near, ranum around 345 pm cdt. rindal and bejou around 350 pm cdt. winger around 400 pm cdt. erskine around 405 pm cdt. Mcintosh around 410 pm cdt. 6/13/2017 3:35 PM CDT Quarter sized hail reported 154.7 miles ESE of Mahnomen, MN, very heavy rain and dime to quarter sized hail. 6/13/2017 3:27 PM CDT At 326 pm cdt, a severe thunderstorm was located over twin valley, or 34 miles northwest of detroit lakes, moving northeast at 45 mph (radar indicated). Hazards include 60 mph wind gusts and quarter size hail. Hail damage to vehicles is expected. expect wind damage to roofs, siding, and trees. this severe storm will be near, faith around 335 pm cdt. gary and waukon around 340 pm cdt. ranum, rindal and bejou around 350 pm cdt. winger around 400 pm cdt. Mcintosh and erskine around 410 pm cdt. 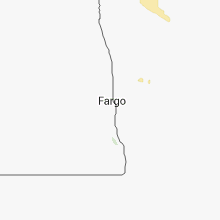 6/13/2017 3:07 PM CDT At 307 pm cdt, a severe thunderstorm was located near felton, or 22 miles northeast of fargo, moving northeast at 45 mph (radar indicated). Hazards include 60 mph wind gusts and quarter size hail. Hail damage to vehicles is expected. expect wind damage to roofs, siding, and trees. 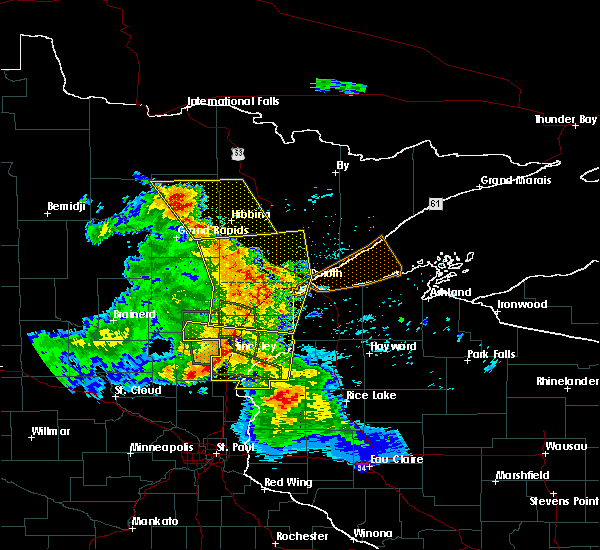 this severe thunderstorm will be near, ulen around 315 pm cdt. syre and flom around 325 pm cdt. twin valley around 330 pm cdt. faith around 335 pm cdt. Gary and waukon around 340 pm cdt. 8/28/2016 11:59 PM CDT At 1159 pm cdt, a severe thunderstorm was located over richwood, or 8 miles north of detroit lakes, moving southeast at 30 mph (radar indicated). Hazards include 60 mph wind gusts and quarter size hail. Hail damage to vehicles is expected. expect wind damage to roofs, siding, and trees. This severe thunderstorm will remain over mainly rural areas of western becker, southwestern clearwater, southern mahnomen, southeastern norman and northeastern clay counties. 8/28/2016 11:31 PM CDT At 1130 pm cdt, a severe thunderstorm was located near flom, or 23 miles northwest of detroit lakes, moving southeast at 10 mph (radar indicated). Hazards include 60 mph wind gusts and quarter size hail. Hail damage to vehicles is expected. expect wind damage to roofs, siding, and trees. this severe thunderstorm will be near, waubun around 1150 pm cdt. ogema around 1205 am cdt. 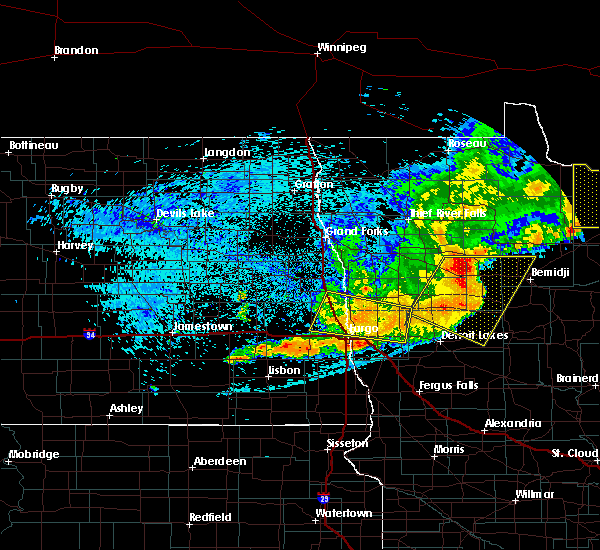 Callaway, white earth and richwood around 1230 am cdt. 8/28/2016 11:18 PM CDT At 1117 pm cdt, a severe thunderstorm capable of producing a tornado was located near waubun, or 29 miles north of detroit lakes, moving southeast at 10 mph (radar indicated rotation). Hazards include tornado and quarter size hail. Expect damage to mobile homes. roofs. and vehicles. 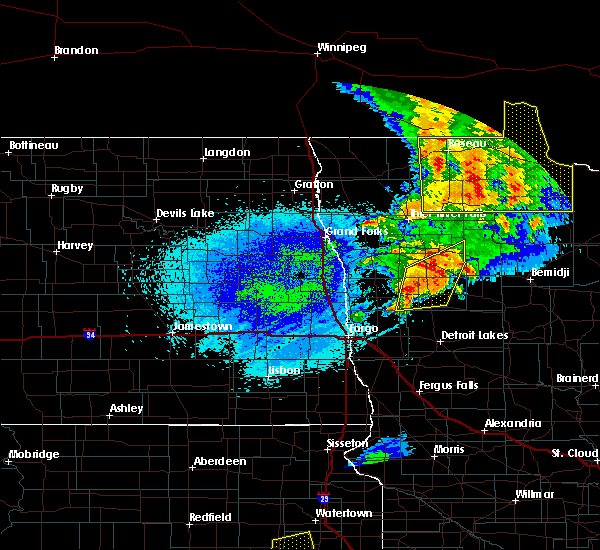 This dangerous storm will be near, waubun and ogema around 1130 pm cdt. 8/28/2016 10:41 PM CDT At 1040 pm cdt, a severe thunderstorm capable of producing a tornado was located near waukon, or 38 miles north of detroit lakes, moving southeast at 20 mph (radar indicated rotation). Hazards include tornado and quarter size hail. Expect damage to mobile homes. roofs. and vehicles. 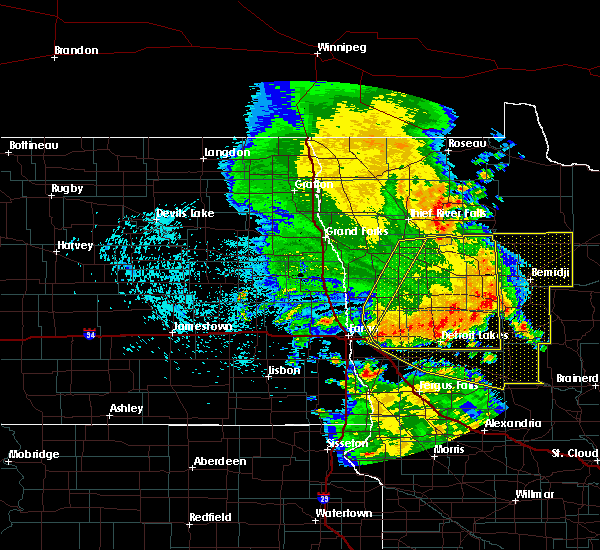 this dangerous storm will be near, mahnomen around 1050 pm cdt. waubun around 1055 pm cdt. ogema around 1100 pm cdt. 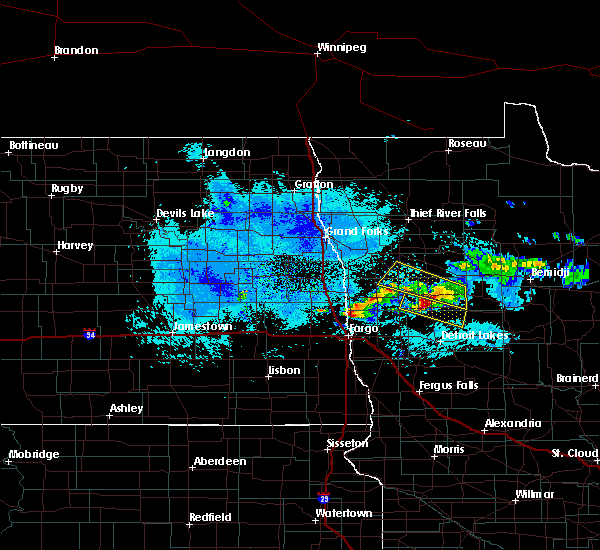 white earth around 1105 pm cdt. Tulaby lake around 1110 pm cdt. 8/4/2016 4:37 AM CDT At 434 am cdt, severe thunderstorms were located along a line extending from boulder lake, to near oliver, moving east at 50 mph (radar indicated). Hazards include 70 mph wind gusts and penny size hail. Expect considerable tree damage. damage is likely to mobile homes, roofs, and outbuildings. these severe storms will be near, south range and wisconsin point around 445 am cdt. hawthorne around 450 am cdt. poplar in douglas county around 455 am cdt. 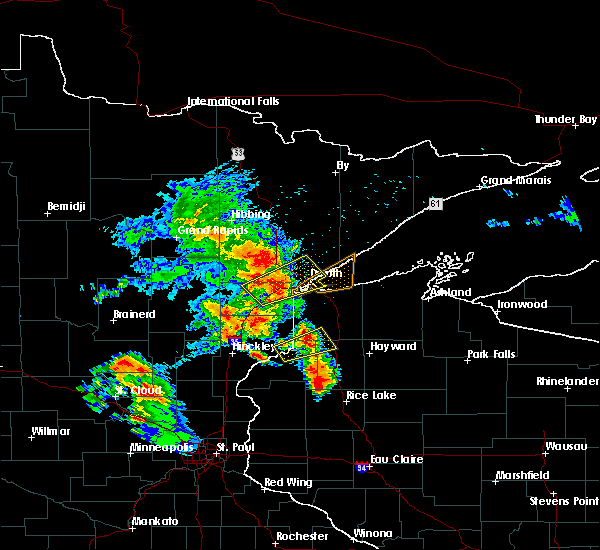 two harbors, lake nebagamon and maple around 500 am cdt. Other locations impacted by these severe thunderstorms include prosit, billings park, lakewood twp, pattison state park, chester park, wentworth, morley hts/parkview, alborn, patzau and waino. 8/4/2016 4:15 AM CDT At 414 am cdt, severe thunderstorms were located along a line extending from canyon, to near nemadji, moving east at 50 mph (radar indicated). Hazards include 70 mph wind gusts and penny size hail. Expect considerable tree damage. damage is likely to mobile homes, roofs, and outbuildings. severe thunderstorms will be near, foxboro around 425 am cdt. duluth and boulder lake around 430 am cdt. 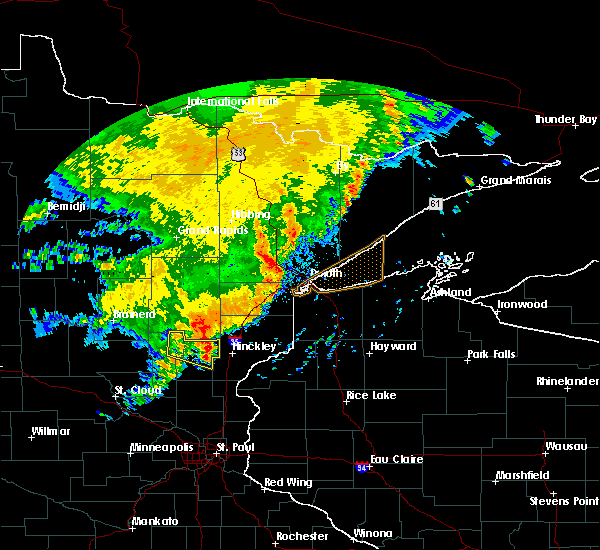 superior around 440 am cdt. hawthorne around 450 am cdt. poplar in douglas county around 455 am cdt. two harbors, lake nebagamon, maple and brule around 500 am cdt. Other locations impacted by these severe thunderstorms include prosit, billings park, lakewood twp, pattison state park, chester park, wentworth, morley hts/parkview, alborn, patzau and waino. 7/21/2016 3:35 AM CDT At 335 am cdt, severe thunderstorms were located along a line extending from near whiteface reservoir, to near oliver, moving east at 45 mph. these are very dangerous storms (trained weather spotters). Hazards include 80 mph wind gusts and half dollar size hail. Flying debris will be dangerous to those caught without shelter. mobile homes will be heavily damaged. expect considerable damage to roofs, windows, and vehicles. extensive tree damage and power outages are likely. 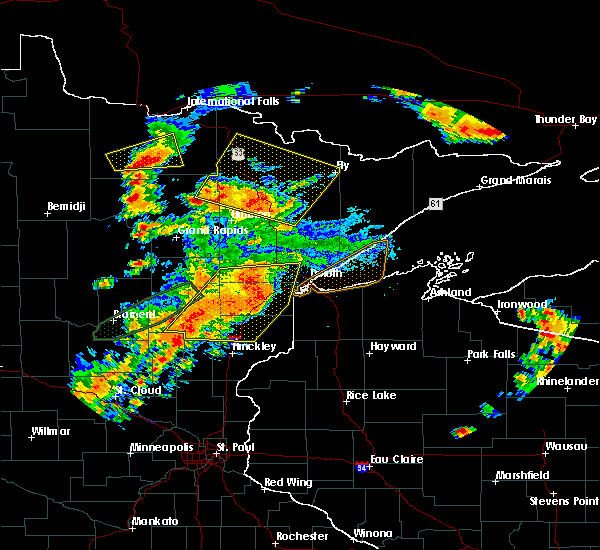 these severe storms will be near, superior, fairbanks and wolf lake around 345 am cdt. south range, brimson and wisconsin point around 350 am cdt. Other locations impacted by these severe thunderstorms include prosit, billings park, lakewood twp, chester park, morley hts/parkview, alborn, east hillside, taft, congdon park and twig. 7/21/2016 3:21 AM CDT At 319 am cdt, severe thunderstorms were located along a line extending from 6 miles west of whiteface reservoir, to near wrenshall, moving east at 55 mph (radar indicated). Hazards include 70 mph wind gusts and half dollar size hail. Hail damage to vehicles is expected. expect considerable tree damage. wind damage is also likely to mobile homes, roofs, and outbuildings. 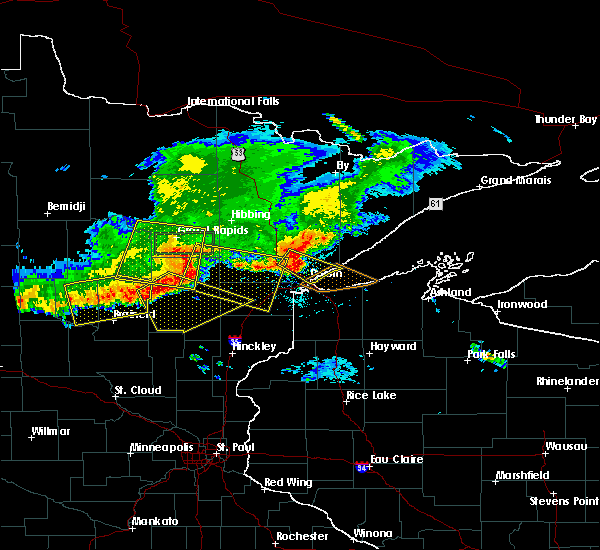 these severe storms will be near, whiteface reservoir around 330 am cdt. 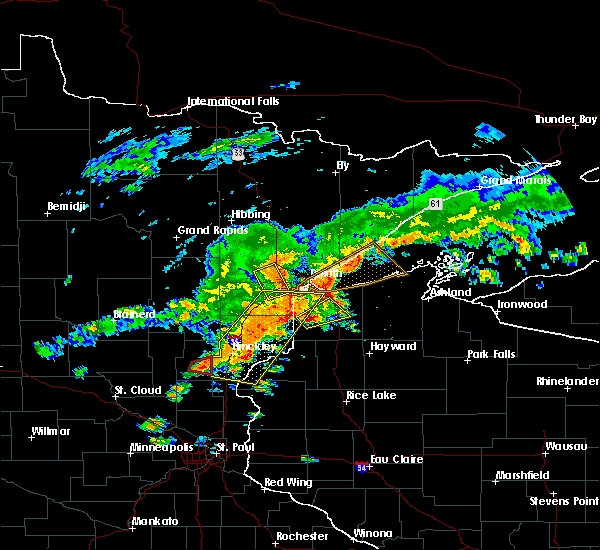 oliver and duluth around 335 am cdt. 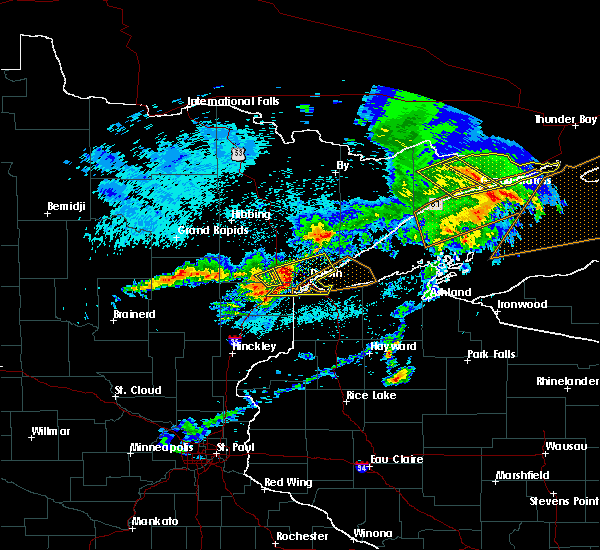 fairbanks, wolf lake and wisconsin point around 340 am cdt. 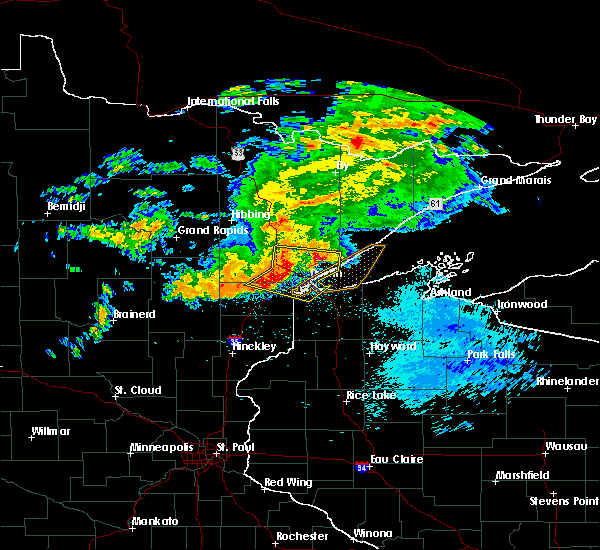 superior, south range and brimson around 345 am cdt. Other locations impacted by these severe thunderstorms include prosit, billings park, lakewood twp, chester park, morley hts/parkview, alborn, east hillside, gowan, taft and congdon park. 7/21/2016 3:00 AM CDT At 257 am cdt, severe thunderstorms were located along a line extending from near cherry, to near cromwell, moving east at 45 mph (radar indicated). Hazards include 60 mph wind gusts. Expect damage to roofs. siding. and trees. 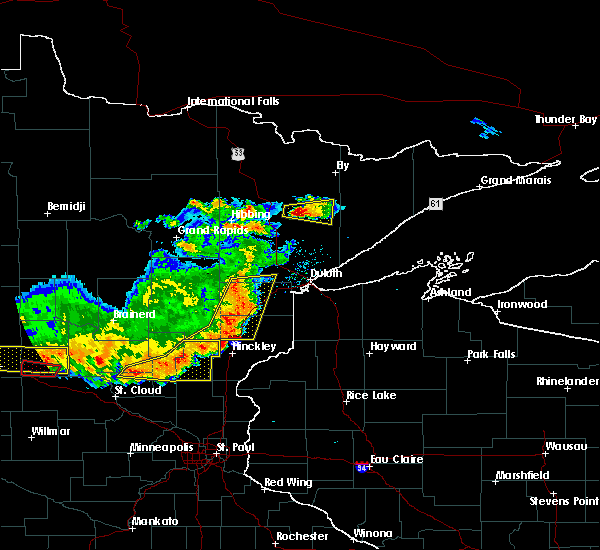 severe thunderstorms will be near, eveleth around 315 am cdt. 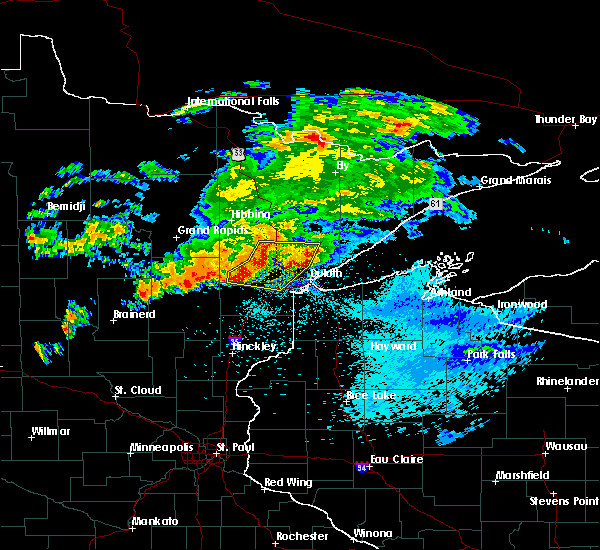 cloquet around 325 am cdt. scanlon and carlton around 330 am cdt. wrenshall and thomson around 335 am cdt. whiteface reservoir around 340 am cdt. 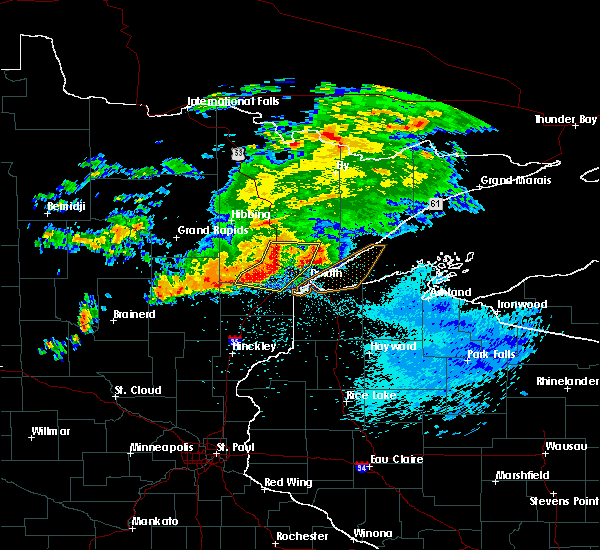 duluth, proctor and oliver around 345 am cdt. 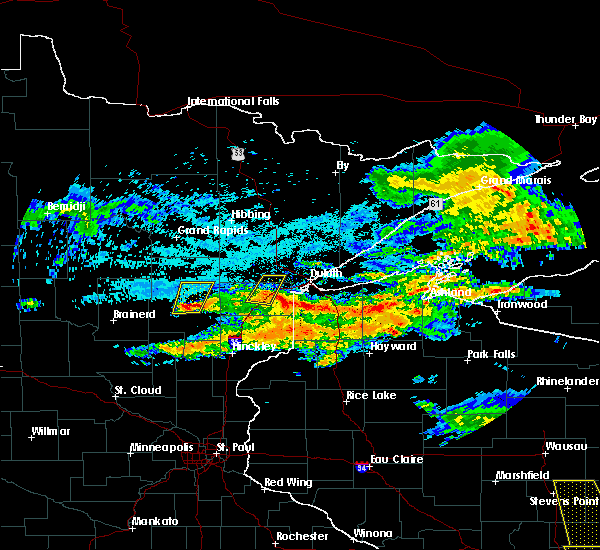 superior and wolf lake around 350 am cdt. Other locations impacted by these severe thunderstorms include prosit, billings park, lakewood twp, chester park, morley hts/parkview, alborn, east hillside, gowan, taft and congdon park. 7/21/2016 12:31 AM CDT At 1230 am cdt, severe thunderstorms were located along a line extending from near gonvick to near long lost lake to near richwood, moving southeast at 70 mph. these are very dangerous storms (radar indicated). Hazards include 80 mph wind gusts. Flying debris will be dangerous to those caught without shelter. mobile homes will be heavily damaged. expect considerable damage to roofs, windows, and vehicles. extensive tree damage and power outages are likely. these severe storms will be near, bad medicine lake, long lost lake and zerkel around 1235 am cdt. height of land lake, bagley and lake itasca around 1240 am cdt. toad lake, shevlin and pine point around 1245 am cdt. Wilton, snellman and wolf lake around 1250 am cdt. 7/21/2016 12:16 AM CDT At 1215 am cdt, severe thunderstorms were located along a line extending from near olga to flom, moving east at 60 mph. these are very dangerous storms (radar indicated. 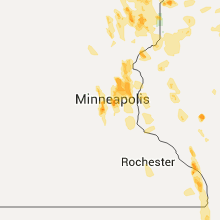 measured wind gust of 71 mph in mahnomen). Hazards include 80 mph wind gusts. Flying debris will be dangerous to those caught without shelter. mobile homes will be heavily damaged. expect considerable damage to roofs, windows, and vehicles. extensive tree damage and power outages are likely. these severe storms will be near, olga around 1220 am cdt. 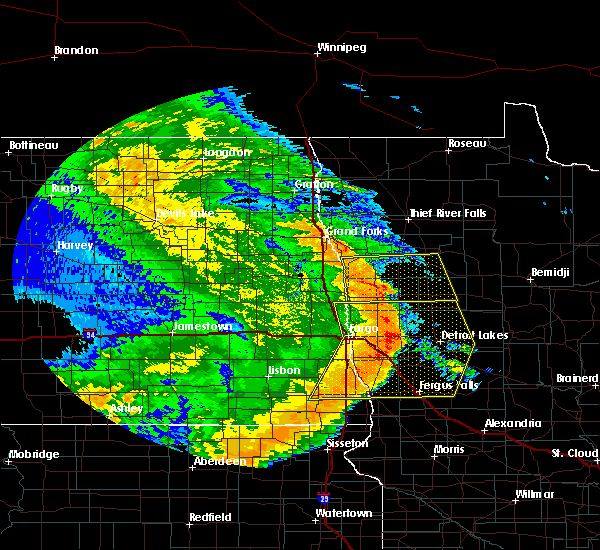 weme around 1225 am cdt. 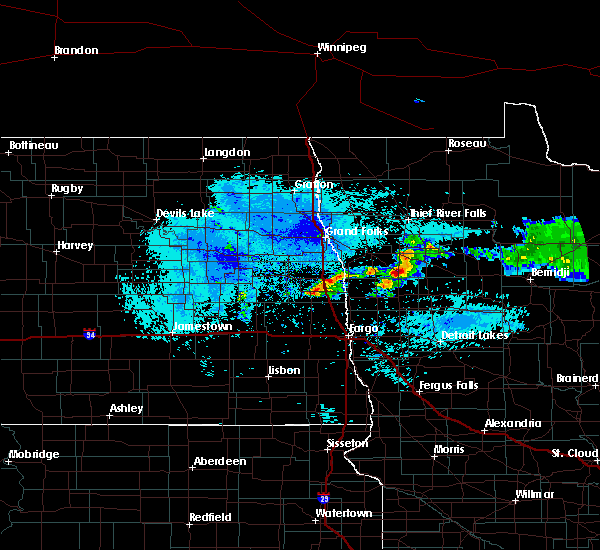 white earth, clearbrook and richwood around 1230 am cdt. 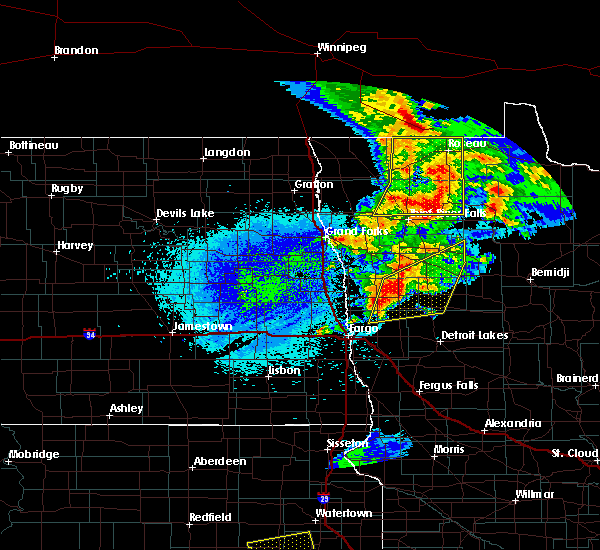 bagley, tulaby lake and leonard around 1235 am cdt. Many point lake and shevlin around 1240 am cdt. 7/21/2016 12:10 AM CDT At 1210 am cdt, severe thunderstorms were located along a line extending from 6 miles northeast of mcintosh to near syre, moving east at 60 mph (radar indicated). Hazards include 70 mph wind gusts. Expect considerable tree damage. damage is likely to mobile homes, roofs, and outbuildings. 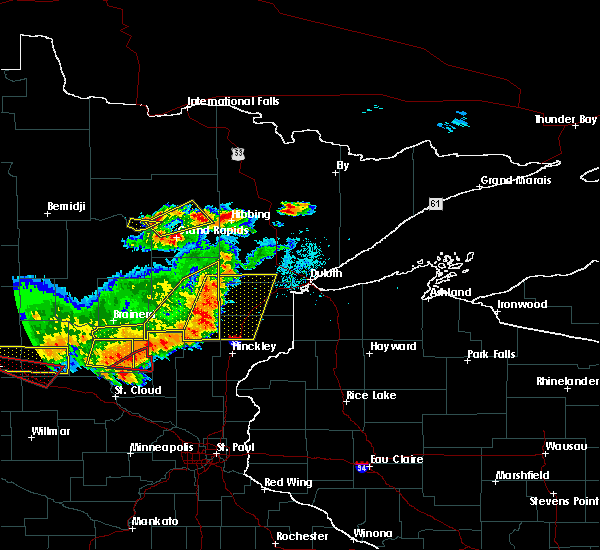 these severe storms will be near, waubun and olga around 1220 am cdt. 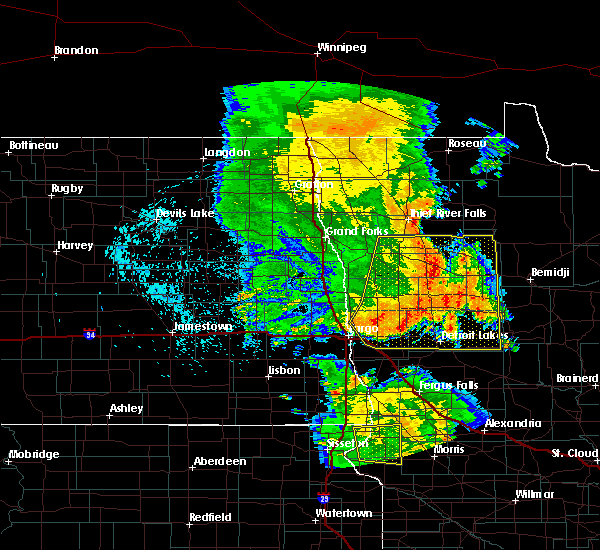 ogema and weme around 1225 am cdt. 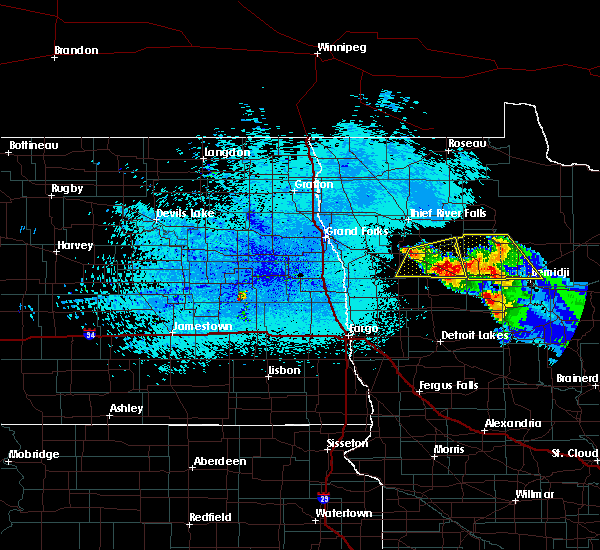 white earth and clearbrook around 1230 am cdt. 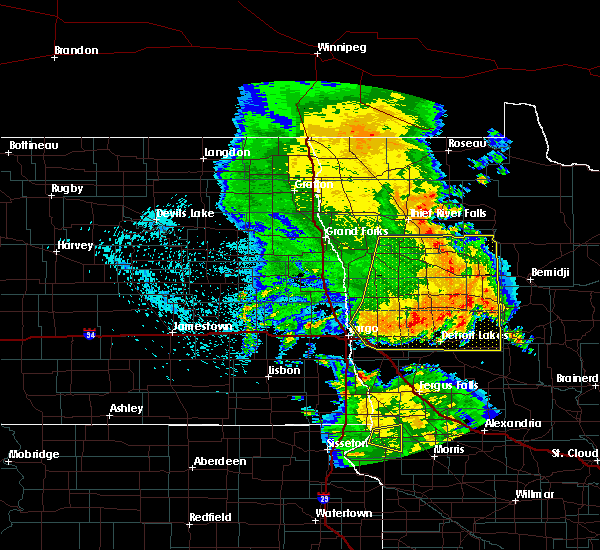 bagley and leonard around 1235 am cdt. Tulaby lake and shevlin around 1240 am cdt. 7/21/2016 12:03 AM CDT At 1203 am cdt, severe thunderstorms were located along a line extending from 6 miles southwest of trail to near felton, moving east at 60 mph (radar indicated). Hazards include 60 mph wind gusts. Expect damage to roofs. siding. and trees. severe thunderstorms will be near, mcintosh around 1205 am cdt. olga and syre around 1210 am cdt. weme around 1215 am cdt. clearbrook around 1220 am cdt. 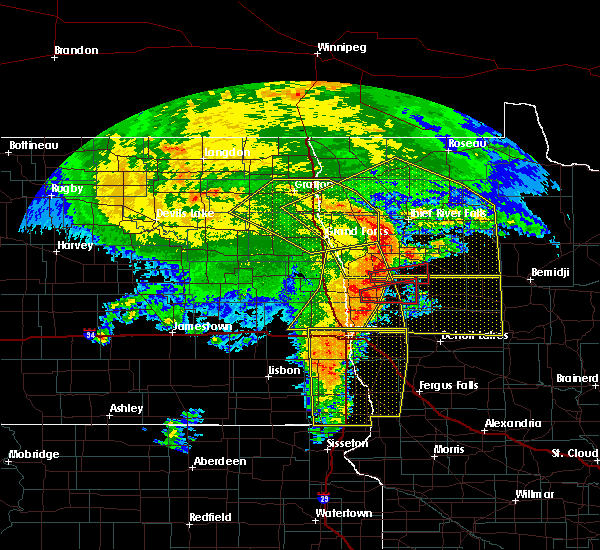 Bagley around 1225 am cdt. 7/11/2016 1:33 AM CDT At 133 am cdt, severe thunderstorms were located along a line extending from near crookston to gary, moving east at 55 mph (radar indicated). Hazards include 60 mph wind gusts. Expect damage to roofs. siding. and trees. these severe storms will be near, gary, twin valley and flaming around 135 am cdt. 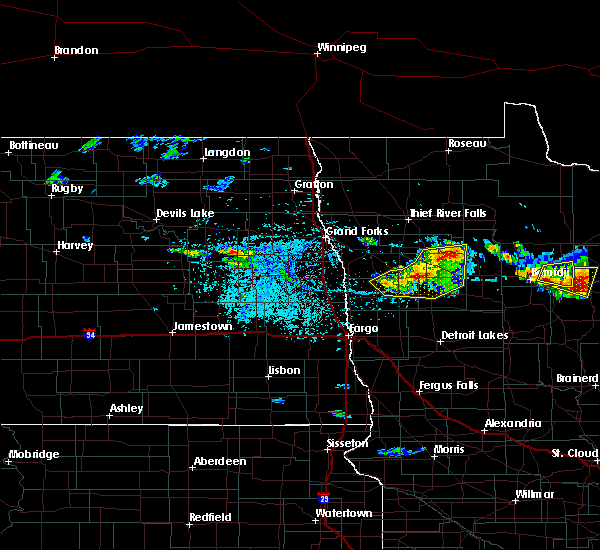 waukon, faith and ranum around 140 am cdt. 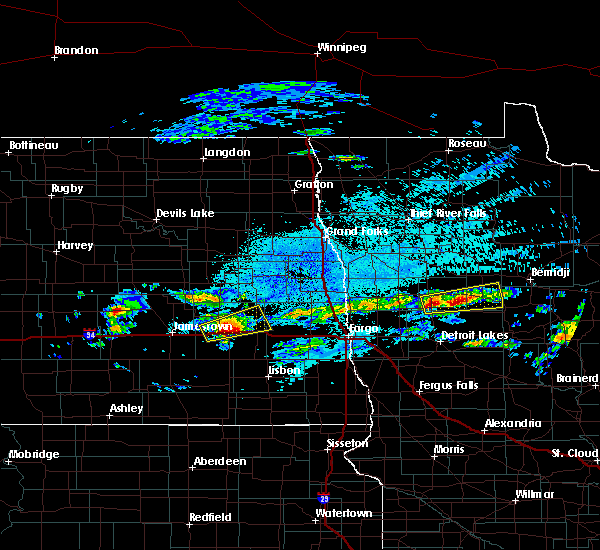 mahnomen around 145 am cdt. bejou and dugdale around 150 am cdt. Mentor and beaulieu around 155 am cdt. 7/11/2016 1:06 AM CDT At 105 am cdt, severe thunderstorms were located along a line extending from near reynolds to near hendrum, moving east at 55 mph (radar indicated). Hazards include 70 mph wind gusts. Expect considerable tree damage. damage is likely to mobile homes, roofs, and outbuildings. severe thunderstorms will be near, hendrum and halstad around 110 am cdt. ada, climax and hadler around 120 am cdt. gary and twin valley around 130 am cdt. harold and flaming around 135 am cdt. 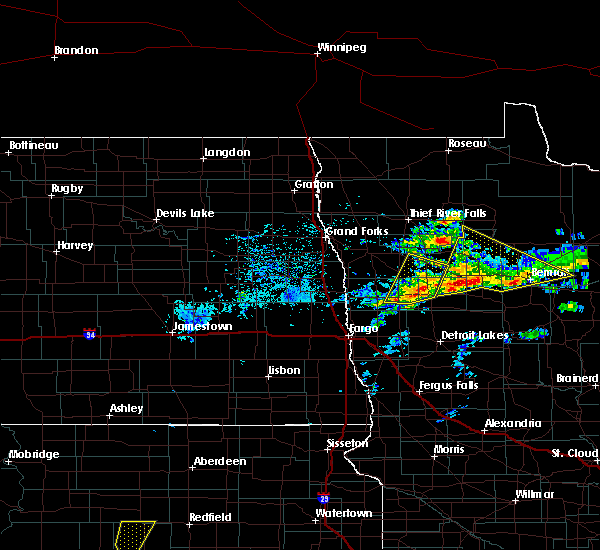 Waukon, faith and ranum around 140 am cdt. 6/25/2016 4:52 PM CDT At 451 pm cdt, a severe thunderstorm was located over proctor, or 7 miles west of superior, moving east at 40 mph (radar indicated. 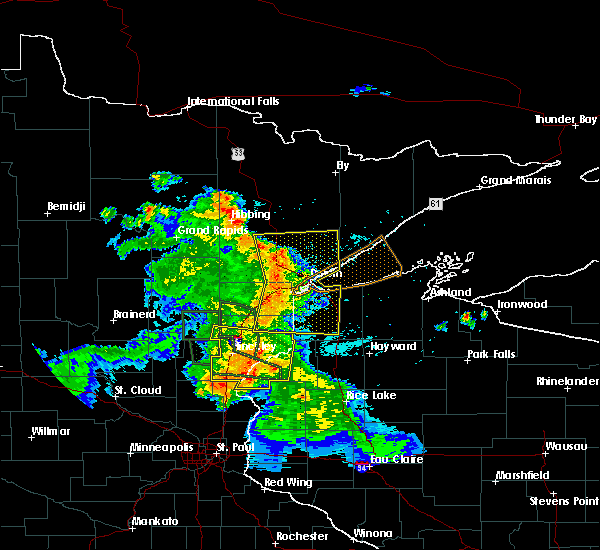 this storm has a history of producing wind damage in the cromwell and cloquet areas). Hazards include 70 mph wind gusts and quarter size hail. Hail damage to vehicles is expected. expect considerable tree damage. wind damage is also likely to mobile homes, roofs, and outbuildings. locations impacted include, duluth, superior, cloquet, hermantown, two harbors, proctor, hawthorne, lake nebagamon, scanlon, carlton, maple, brule, barnum, mahtowa, poplar in douglas county, wrenshall, oliver, holyoke, thomson and brookston. A tornado watch remains in effect until 900 pm cdt for northeastern minnesota, and northwestern wisconsin. 6/25/2016 4:46 PM CDT At 445 pm cdt, severe thunderstorms were located along a line extending from near kettle river to 8 miles south of mcgrath, moving east at 55 mph (radar indicated). Hazards include 70 mph wind gusts and nickel size hail. Expect considerable tree damage. damage is likely to mobile homes, roofs, and outbuildings. locations impacted include, cloquet, mille lacs lake, hermantown, sandstone, scanlon, carlton, barnum, mahtowa, willow river, wrenshall, askov, malmo, cromwell, rutledge, kettle river, thomson, bruno, tamarack, mcgrath and nemadji. 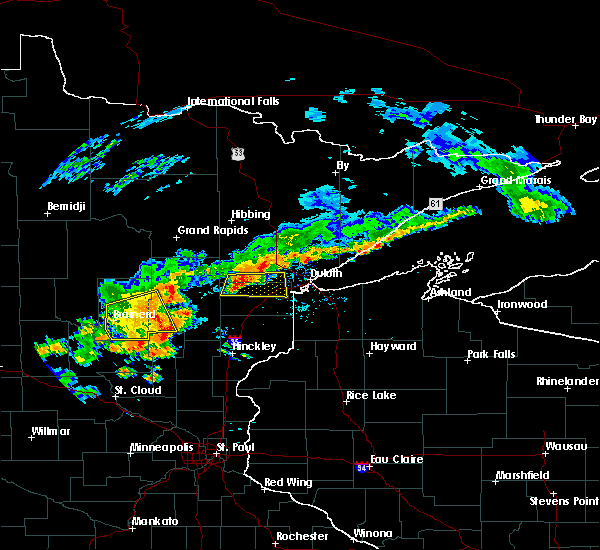 A tornado watch remains in effect until 900 pm cdt for northeastern minnesota. 6/25/2016 4:36 PM CDT At 435 pm cdt, a severe thunderstorm was located near carlton, or near cloquet, moving east at 50 mph. this is a very dangerous storm (radar indicated). Hazards include 80 mph wind gusts and quarter size hail. Flying debris will be dangerous to those caught without shelter. mobile homes will be heavily damaged. expect considerable damage to roofs, windows, and vehicles. Extensive tree damage and power outages are likely. 6/25/2016 4:28 PM CDT At 426 pm cdt, dangerous severe thunderstorms were located along a line extending from near brookston to near mahtowa to 7 miles northwest of rutledge, moving east at 50 mph (radar indicated). Hazards include 80 mph wind gusts and nickel size hail. Flying debris will be dangerous to those caught without shelter. mobile homes will be heavily damaged. expect considerable damage to roofs, windows, and vehicles. extensive tree damage and power outages are likely. locations impacted include, cloquet, mille lacs lake, hermantown, sandstone, scanlon, carlton, barnum, mahtowa, willow river, wrenshall, mcgregor, askov, malmo, cromwell, rutledge, kettle river, thomson, brookston, bruno and tamarack. A tornado watch remains in effect until 900 pm cdt for northeastern minnesota. 6/25/2016 4:21 PM CDT At 419 pm cdt, severe thunderstorms were located along a line extending from 7 miles northeast of cromwell to 7 miles west of mahtowa to 6 miles east of mcgrath, moving east at 65 mph. these are very dangerous storms. radar indicates that a narrow corridor of very strong winds, perhaps up to 80 mph will affect areas along the highway 210 corridor from cromwell to cloquet (radar indicated). Hazards include 80 mph wind gusts and quarter size hail. Flying debris will be dangerous to those caught without shelter. mobile homes will be heavily damaged. expect considerable damage to roofs, windows, and vehicles. extensive tree damage and power outages are likely. locations impacted include, cloquet, mille lacs lake, hermantown, sandstone, scanlon, carlton, barnum, mahtowa, willow river, wrenshall, mcgregor, askov, malmo, cromwell, rutledge, kettle river, thomson, brookston, bruno and tamarack. 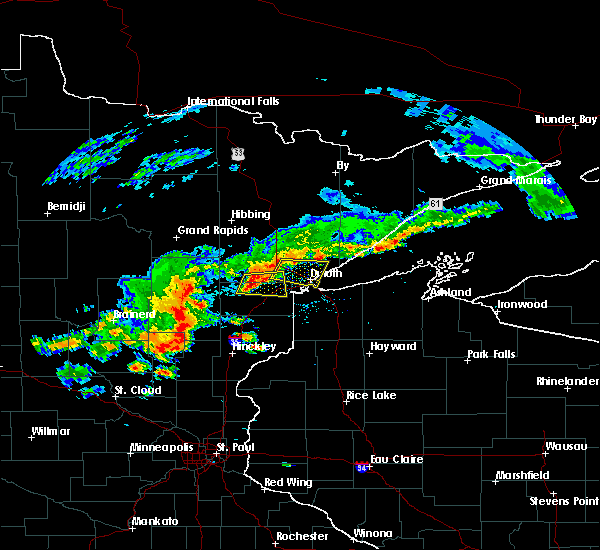 A tornado watch remains in effect until 900 pm cdt for northeastern minnesota. 6/25/2016 4:07 PM CDT At 406 pm cdt, severe thunderstorms were located along a line extending from 7 miles north of cromwell to 6 miles northwest of kettle river to 6 miles north of isle, moving east at 50 mph (radar indicated). Hazards include 70 mph wind gusts and quarter size hail. Hail damage to vehicles is expected. expect considerable tree damage. Wind damage is also likely to mobile homes, roofs, and outbuildings. 6/17/2016 9:05 AM CDT At 904 am cdt, severe thunderstorms were located along a line extending from near trail to lengby to near beaulieu, moving east at 25 mph (radar indicated). Hazards include 60 mph wind gusts and quarter size hail. Hail damage to vehicles is expected. expect wind damage to roofs, siding, and trees. 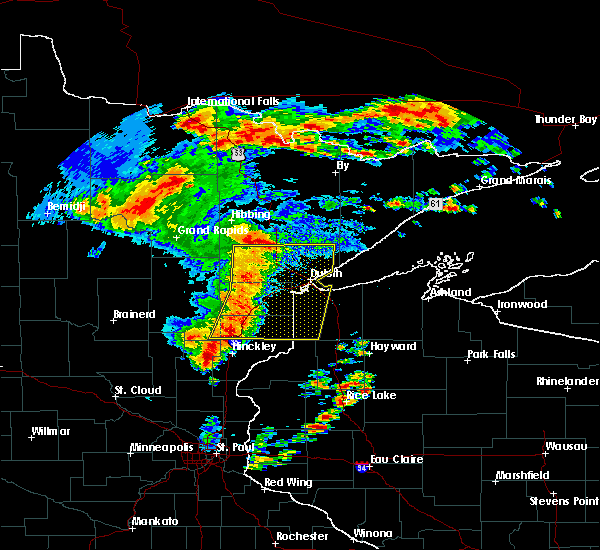 severe thunderstorms will be near, lengby, olga and pine bend around 910 am cdt. gully and ebro around 915 am cdt. 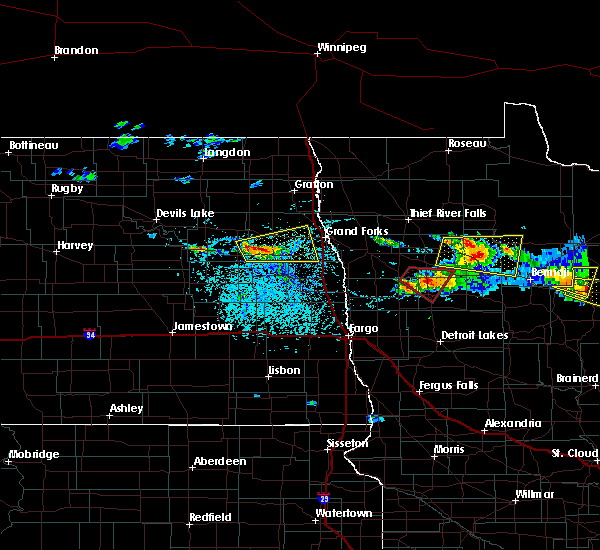 gonvick, mahkonce and weme around 925 am cdt. bagley around 930 am cdt. Clearbrook and roy lake around 935 am cdt. 8/12/2015 11:00 PM CDT Golf Ball sized hail reported 162.2 miles ESE of Mahnomen, MN, report and photo posted via social media. time estimated based on radar. 8/2/2015 6:36 AM CDT The severe thunderstorm warning for northeastern norman, south central polk and mahnomen counties will expire at 645 am cdt, the storm which prompted the warning has weakened below severe limits, and no longer pose an immediate threat to life or property. therefore the warning will be allowed to expire. however there is a severe storm impact southeastern norman into southwestern mahnomen and parts of northern becker county and that warning will remain in place. 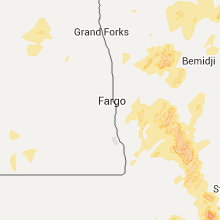 8/2/2015 6:01 AM CDT At 601 am cdt, a severe thunderstorm was located over fertile, or 38 miles south of thief river falls, moving southeast at 50 mph (radar indicated). Hazards include ping pong ball size hail and 60 mph wind gusts. People and animals outdoors will be injured. expect hail damage to roofs, siding, windows and vehicles. expect wind damage to roofs, siding and trees. 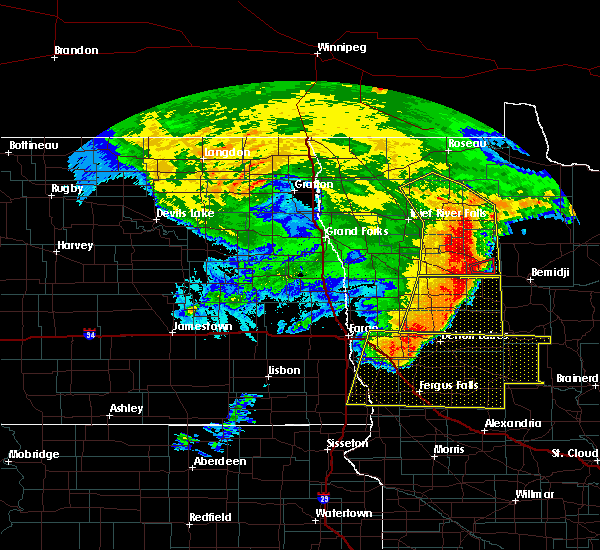 this severe thunderstorm will be near, rindal and ranum around 610 am cdt. winger around 615 am cdt. bejou around 620 am cdt. 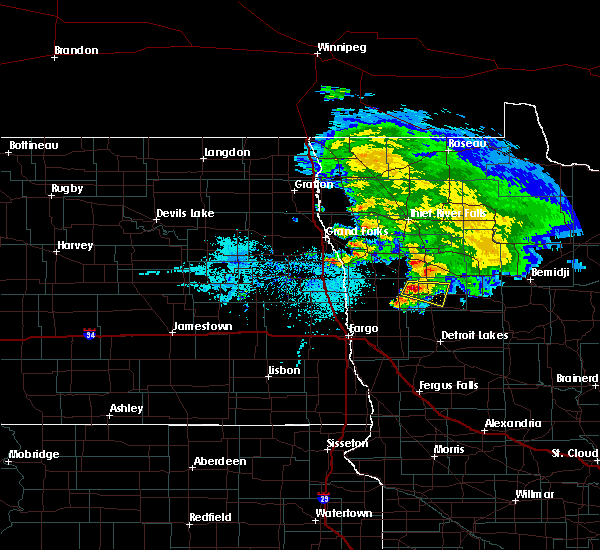 mahnomen around 625 am cdt. Island lake in mahnomen county and beaulieu around 635 am cdt. 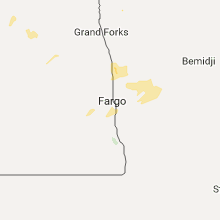 7/24/2015 1:17 AM CDT At 116 am cdt, severe thunderstorms were located along a line extending from near gonvick to near naytahwaush to near rollag, moving east at 50 mph. these are very dangerous storms (radar indicated). Hazards include 80 mph wind gusts and penny size hail. Flying debris will be dangerous to those caught without shelter. mobile homes will be heavily damaged. expect considerable damage to roofs, windows and vehicles. extensive tree damage and power outages are likely. 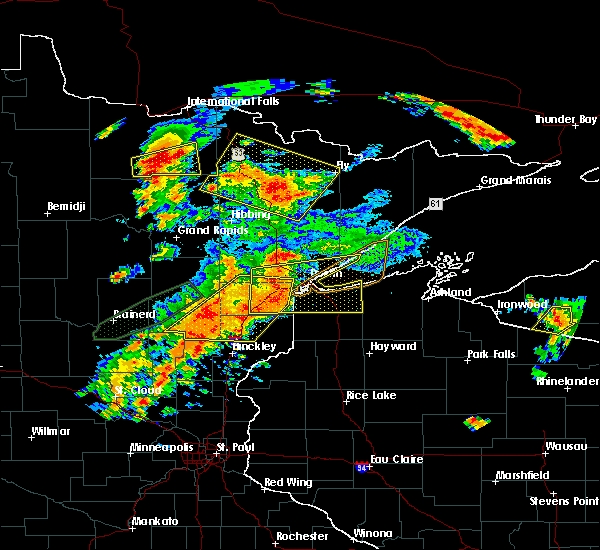 these severe storms will be near, clearbrook, naytahwaush, tulaby lake, gonvick, berner and roy lake around 120 am cdt. 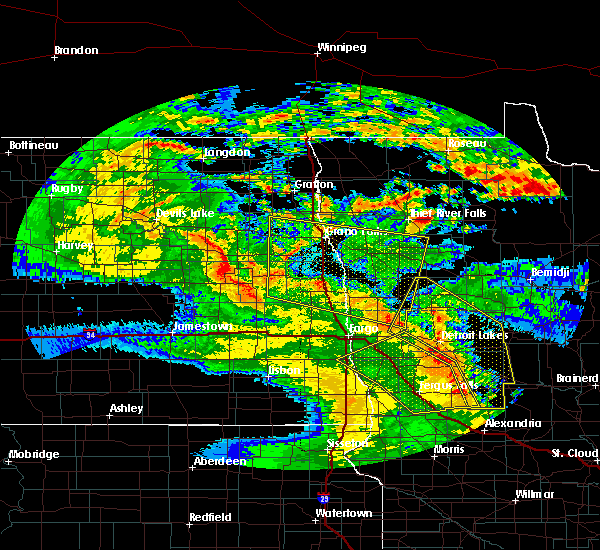 Detroit lakes, shoreham, bad medicine lake, long lost lake, leonard and zerkel around 130 am cdt. 7/24/2015 1:05 AM CDT At 104 am cdt, severe thunderstorms were located along a line extending from trail to near waubun to near muskoda, moving east at 55 mph. these are very dangerous storms (radar indicated). Hazards include 80 mph wind gusts and penny size hail. Flying debris will be dangerous to those caught without shelter. mobile homes will be heavily damaged. expect considerable damage to roofs, windows and vehicles. extensive tree damage and power outages are likely. 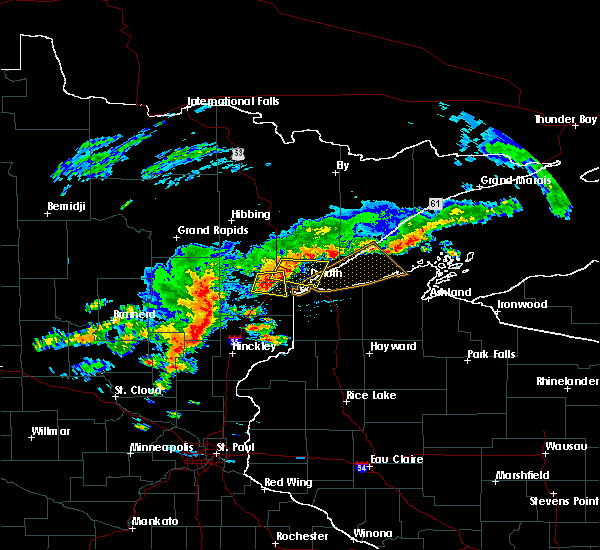 these severe storms will be near, gully, trail, olga and beaulieu around 110 am cdt. 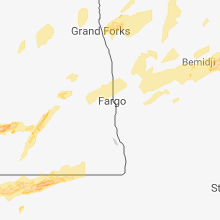 gonvick and berner around 115 am cdt. 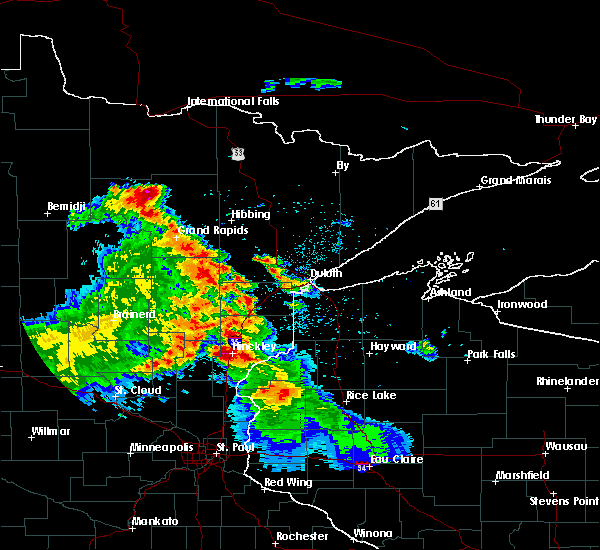 naytahwaush, clearbrook, tulaby lake, lake park, mahkonce and roy lake around 120 am cdt. lower rice lake around 125 am cdt. 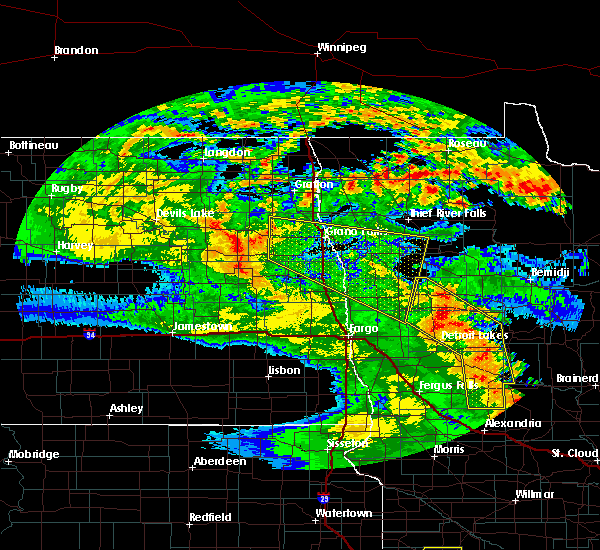 Detroit lakes, shoreham, bad medicine lake, long lost lake, leonard and zerkel around 130 am cdt. 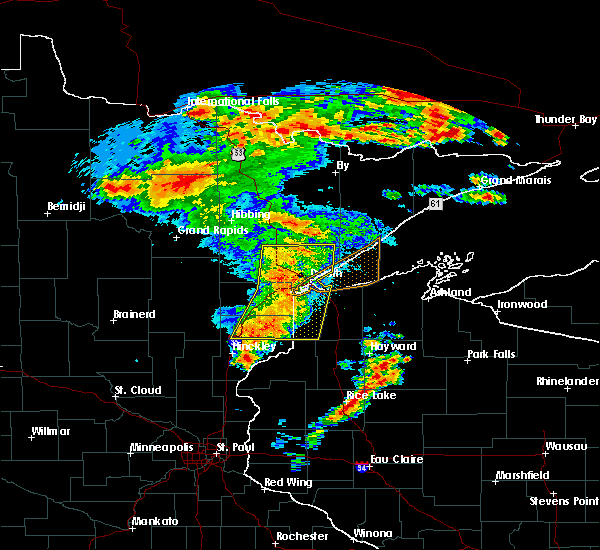 6/7/2015 4:54 PM CDT At 454 pm cdt, a severe thunderstorm was located near beaulieu, or 37 miles north of detroit lakes, moving southeast at 25 mph (radar indicated). Hazards include quarter size hail. Damage to vehicles is expected. this severe storm will be near, beaulieu around 500 pm cdt. Naytahwaush around 525 pm cdt. 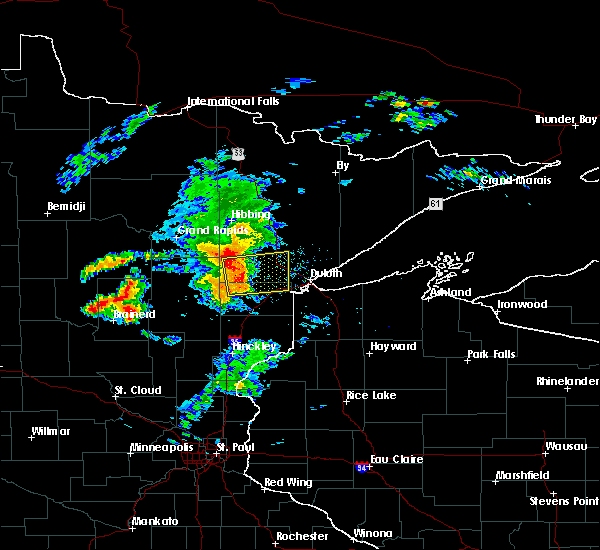 6/7/2015 4:38 PM CDT At 438 pm cdt, a severe thunderstorm was located over bejou, or 42 miles north of detroit lakes, moving southeast at 25 mph (radar indicated). Hazards include quarter size hail. Damage to vehicles is expected. 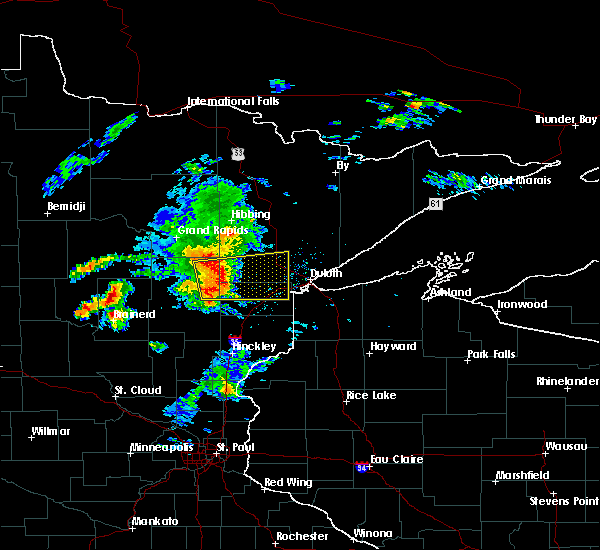 this severe thunderstorm will be near, mahnomen around 450 pm cdt. beaulieu around 500 pm cdt. Naytahwaush around 525 pm cdt.